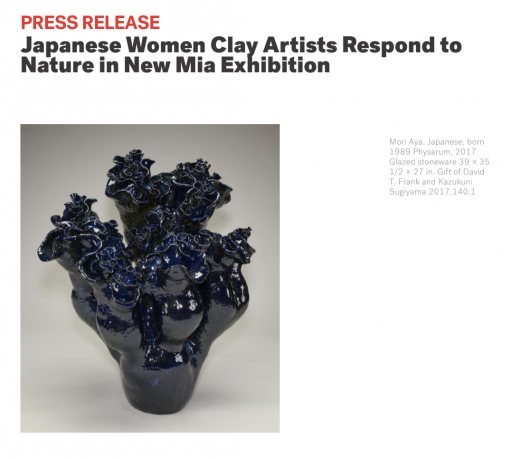 March 20, 2019—A new exhibition at the Minneapolis Institute of Art (Mia) highlights recent work by more than a dozen living Japanese women clay artists who evoke or respond to the natural world in diverse ways, some traditional, others wholly novel. NEW YORK, NY - Asia Week New York got off to a roaring start last week, when 48 galleries, 6 auction houses-Bonhams, Christie's, Doyle, Heritage, iGavel, and Sotheby's and 16 museums opened their doors to collectors, curators, and connoisseurs who converged in New York to get their annual eyeful of what's on offer at the galleries and auction houses now through March 23rd. 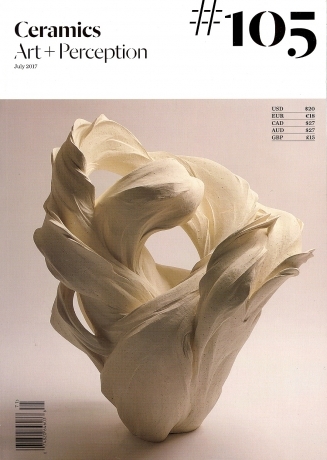 Joan B. Mirviss, a dealer specialising in Japanese art and ceramics, has organized a retrospective (with a lavish bilingual catalogue) of the work of the ceramicist Tomimoto Kenkichi (1886-1963), who travelled to England and befriended Bernard Leach. 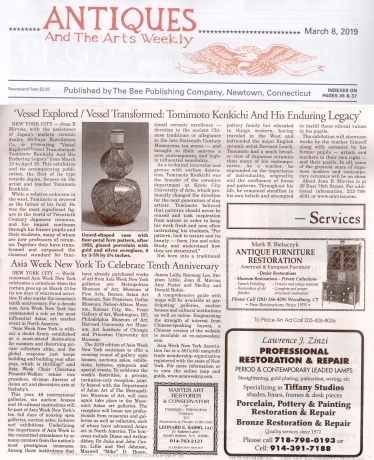 NEW YORK, NY December 2018 JOAN B MIRVISS LTD with the invaluable assistance of Japan's leading modern ceramic dealer, Shibuya Kurodatoen Co., LTD is honored to present Vessel Explored / Vessel Transformed: Tomimoto Kenkichi and his Enduring Legacy. This groundbreaking exhibition and its accompanying publication, the first of its type outside Japan, focuses on the remarkable artist and teacher, Tomimoto Kenkichi. While, a relative unknown in the west, Tomimoto is revered as the father of his field. Joan Mirviss has devoted more than four dcades to the promotion and support of mainly 20th-century Japanese clay wares in New York and this year's solo showcase is in collaboration with Japan-based Shibuya Kurodatoen Co for the artist and teacher Tomimoto Kenkichi (1886-1963). 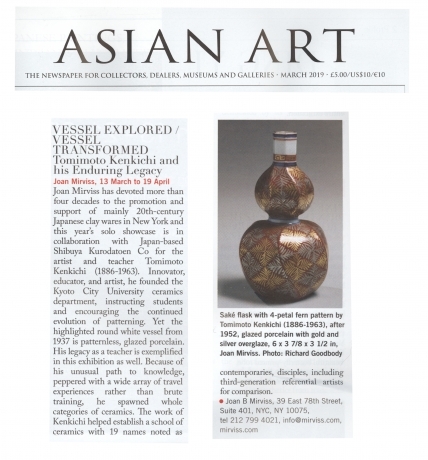 Joan B Mirviss Ltd, with the invaluable assistance of Shibuya Kurodatoen Co., Ltd, Japan's leading modern ceramic dealer, is honoured to present "Vessel Explored / Vessel Transformed- Tomimoto Kenkichi and His Enduring Legacy". Joan Mirviss explained: "Tomimoto is revered as the father of his field. 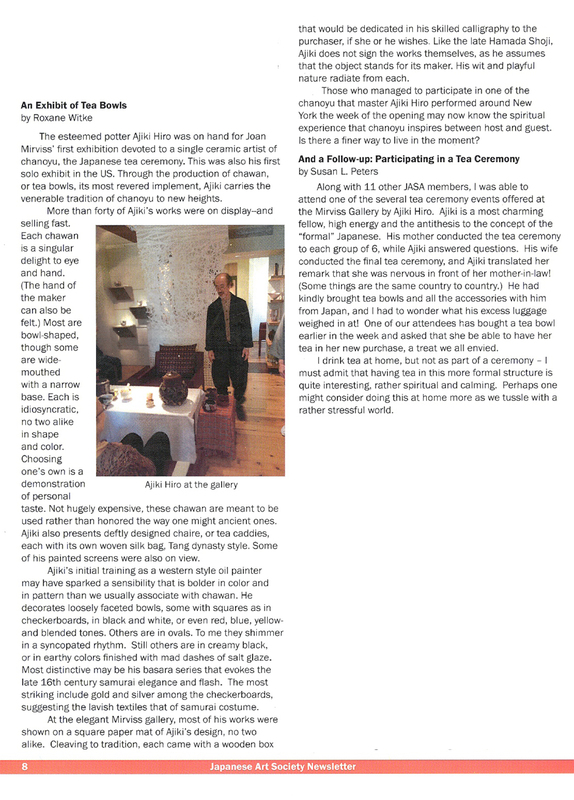 He was the most significant figure in the world of 20th century Japanese ceramics and his impact continues through his gifted and inspired former pupils and their talented students, many of whom are now professors of ceramics." 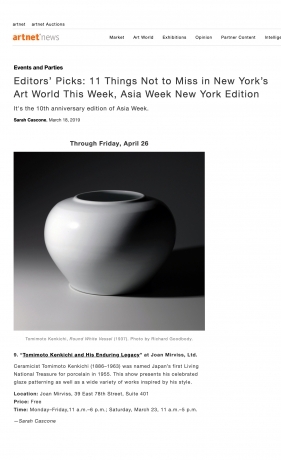 NEW YORK CITY - Joan B Mirviss with the assistance of Japan's modern ceramic dealer, Shibuya Kurodatoen Co, is presenting "Vessel Explored/Vessel Transformed: Tomimoto Kenkichi and His Enduring Legacy" from March 13 - April 20. This exhibition and its accompanying publication, the first of its type outside Japan, focuses on the artist and teacher Tomimoto Kenkichi. 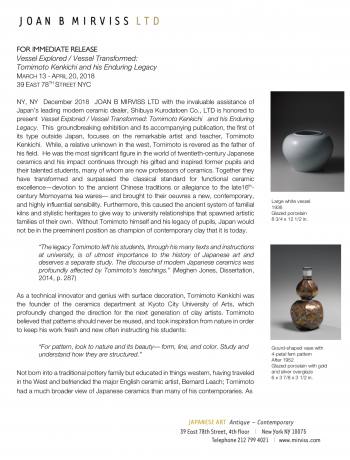 Joan B. Mirviss, a dealer specialising in Japanese art and ceramics, has organised a retrospective (with a lavish bilingual catalogue) of the work of the ceramicist Tomimoto Kenkichi (1886-1963), who travelled to England and befriended Bernard Leach. Tomimoto encouraged his countrymen to study Western art and pursue invention in clay rather than repetition of traditional patterns. 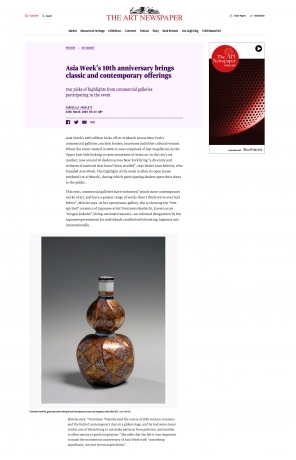 'Vessel Explored / Vessel Transformed: Tomimoto Kenkichi and His Enduring Legacy' will explore Tomimoto's inspirations including Aristide Maillol's fleshy bronze women and William Morris's fern repeats, as well as contemporary Japanese artisans influenced by Tomimoto. 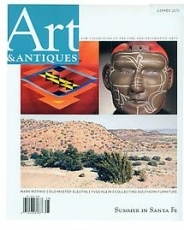 Mirviss says that few American collectors and institutions are aware of his work. She needs to tell his story, she explains, at a high-profile time like Asia Week. 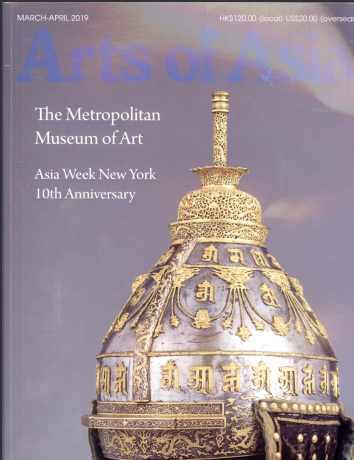 "We cannot ignore Asia," said Mike Hearn, Chair of the Asian Art Department at the Metropolitan Museum of Art, to a nodding crowd of collectors, dealers, and journalists, gathered in anticipation of Asia Week New York, an annual 10-day celebration of Asian Art. 'At fifteen years old, I realised that I wanted to use my hands to create something', says Nagoya-born, Paris-based artist Yoshimi Futamura. Connoisseur, collector, curator or simply an admirer of beauty- all are beneficiaries of the current golden age of Japanes ceramics. 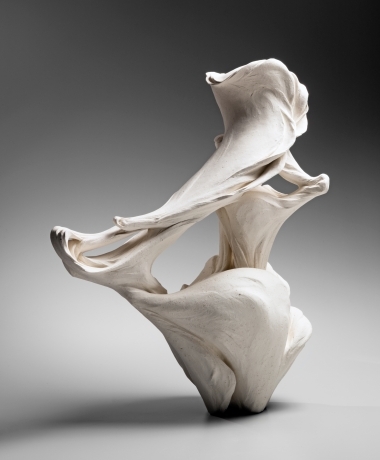 NEW YORK - Joan B. Mirviss Ltd., a leader in Japanese contemporary clay art based in New York, is pleased to present the work of five major ceramic artists at the 2019 Winter Show. The exhibition, "The Five Elements-- Gogyō / Five Japanese Masters of the Art of Clay" features the work of FUTAMURA Yoshimi (b. 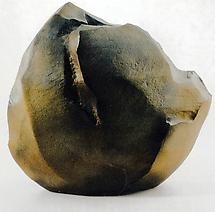 1959), KAKUREZAKI Ryūichi (b. 1950), KANETA Masanao (b. 1953), KONDŌ Takahiro (b. 1958), and YOSHIKAWA Masamichi (b. 1946). 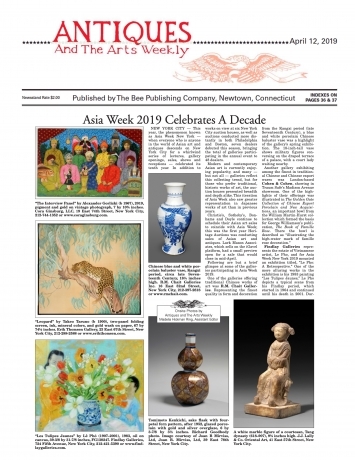 The Asia Week New York Association announces that forty-eight international galleries and six auction houses- Bonhams, Christie's, Doyle, Heritage Auctions, iGavel, and Sotheby's will participate in the 10th anniveresary edition of Asia Week New York 2019, the ten-day celebration of Asian Art and culture that spans the metropolitan region from March 13 through 23, 2019. 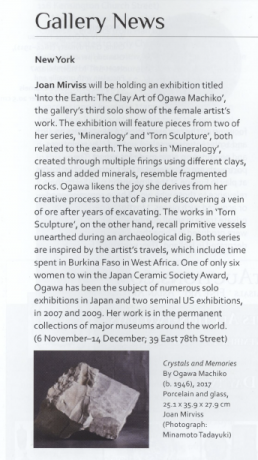 "Ogawa does not so much use clay to achieve self-expression as make herself the means through which the clay reveals its inner strength"
This is the third solo show of the female artist at the gallery. 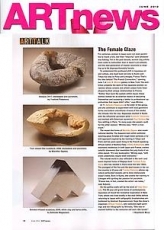 Featuring two main bodies of work, the show focusses on her minerology and torn sculpture series. 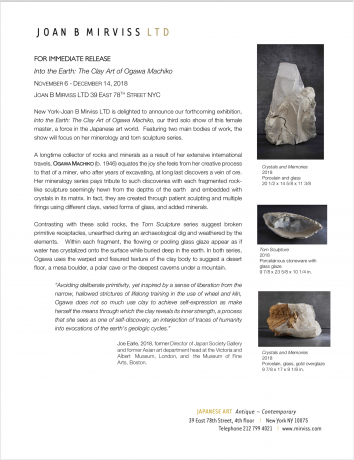 Joan Mirviss will be holding an exhibition titled 'Into the Earth: The Clay Art of Ogawa Machiko', the gallery's third solo show of the female artist's work. 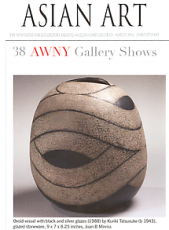 NEW YORK - Joan B. Mirviss Ltd., a leader in Japanese contemporary clay art based in New York, is pleased to present the work of five major ceramic artists at the 2019 Winter Show. The exhibition, "The Five Elements-- Gogyō / Five Japanese Masters of the Art of Clay" features the work of FUTAMURA Yoshimi (b. 1959), KAKUREZAKI Ryūichi (b. 1950), KANETA Masanao (b. 1953), KONDŌ Takahiro (b. 1958), and YOSHIKAWA Masamichi (b. 1946). 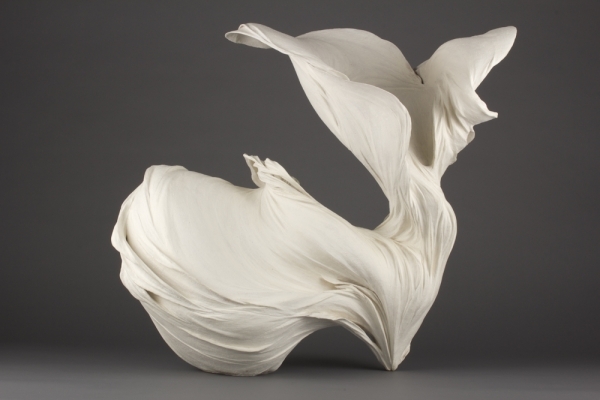 These internationally known ceramists offer the American public a rare look into the world of contemporary Japanese clay drawn from the aesthetics of ancient Asia, refined and reworked in a thoroughly modern context. These five celebrated Japanese ceramic artists have agreed to create new works specifically designed for this remarkable show. 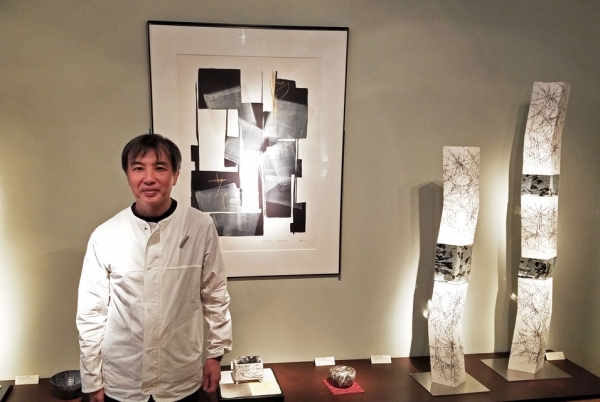 Fukumoto Fuku and Kino Satoshi have received Encouragement Awards at Japan Ceramic Society Encouragement Awards Kansai Region Exhibition on Septemer 17. 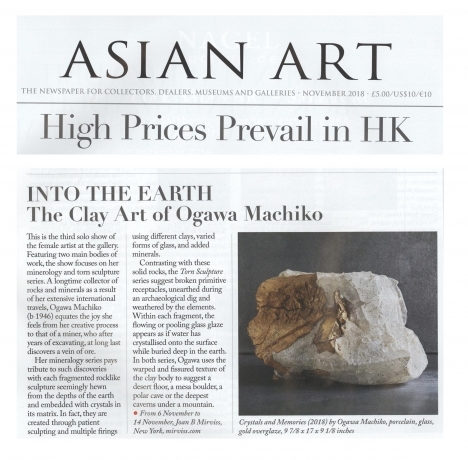 New York- Joan B Mirviss LTD is delighted to announce our forthcoming exhibition, Into the Earth: The Clay Art of Ogawa Machiko, our third solo show of this female master, a force in the Japanese art world. 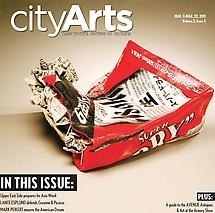 Featuring two main bodies of work, the show will focus on her minerology and torn sculpture series. Traditional Japanese paintings are an excellent buying opportunity, as well as a portal into a world of timeless grace and beauty. 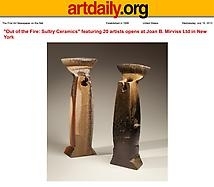 Central New York Gallery Joan B Mirviss LTD will hold four exhibitions over the coming year to highlight the work of four monumental ceramicists. Mishima Kimiyo (b. 1932) has long been known for her trompe l'oiel ceramic objects that appear to be newspapers or household trash. Two recent exhibitions in Tokyo offered paintings, mixed-media and found objects plus large-scale installations including fiberglass, as well as the expected variety of ceramic work. One show was impressive for its breadth and the other was staggering for its large scale. Hoshino Satoru (b. 1945), has established an international reputation through residencies and guest teaching, and for his large installations. While this gallery is a modest space, low-ceilinged and windowless, he transformed it into a dark field of motion with his Beginning Form-Spiral '17. 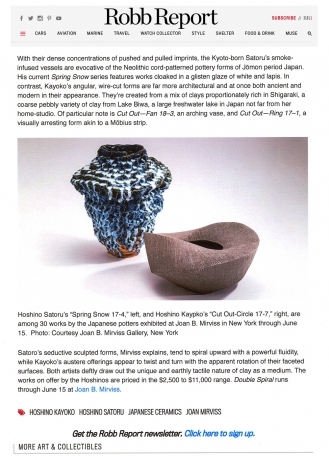 Collectors of contemporary Japanese ceramics have a marvelous opportunity to acquire new works on May 1 when Double Spiral, a selling exhibition of 30 stunning pieces by renowned contemporary Japanese husband and wife potters Hoshino Kayoko and Hoshino Satoru, opens at the Joan B. Mirviss gallery on New York's Upper East Side. 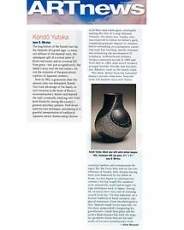 "The exhibition highlights the intertwining physical and spiritual worlds of the couple within their practices, and explores the balance of opposites as represented by the yin-yang taikyokuzu symbol," says Mirviss of the selection of pottery pieces on offer. 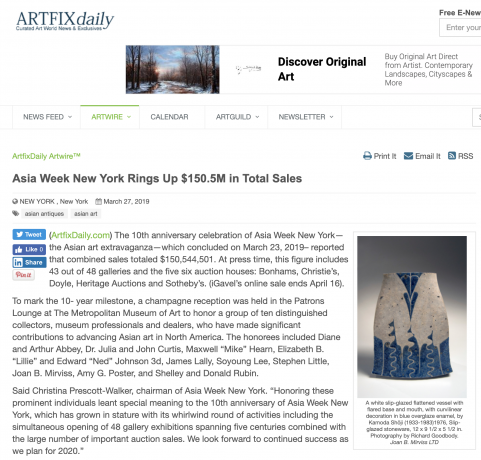 Asia Week New York - the ten-day Asian art extravaganza that concluded on March 24, reports that combined sales totaled $169,819,900. At press time, this figure includes 41 out of 45 galleries and the four auction houses: Bonhams, Christie's, Doyle and Sotheby's. "Mirviss selections are beyond comparison. This is truly the only show in town." 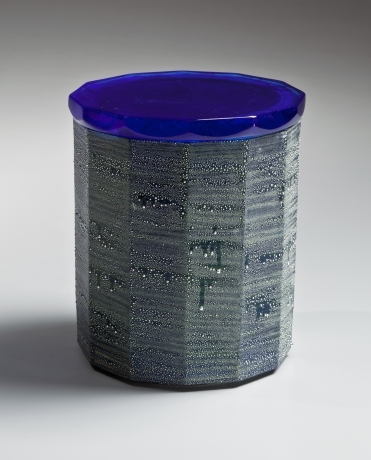 Joan Mirviss's taste in contemporary Japanese ceramics is well known and this year she is presenting works by Matsui Kosei (1927-2003), Kamoda Shoji (1933-1983) and Wada Morihiro (1944-2008), major innovators in the scheme of 20th-century Japanese ceramics. In the field of ceramics, a number of excellent works are on show. 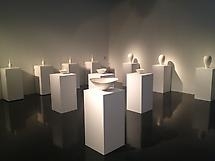 A joint exhibition by Kaikoko and Chambers Fine Art provides an intriguing pairing, placing Neolithic Chinese and Japanese pots side by side, to show how the respective aesthetic values of the two cultures - formality and strucure versus organic freedom - were evident even 2,500 years ago. 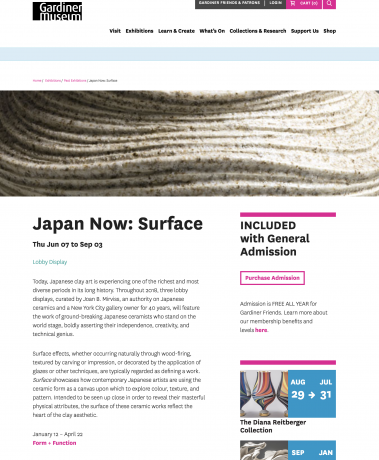 Joan B Mirviss introduces three modern clay artists from Japan who are little-known in the west but whom she believes have 'contributed to altering the style and aesthetic of Japanese ceramic history'. 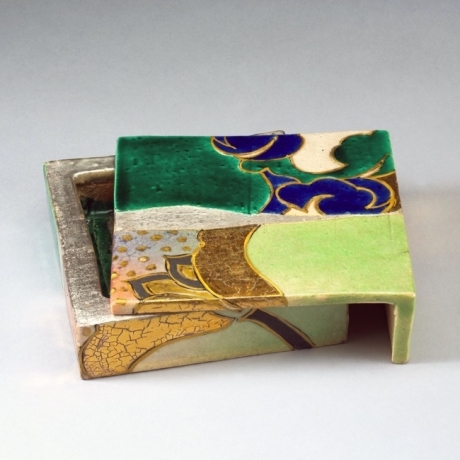 One is Matsui Kosei (1927-2003), a priest and potter who revived the 'neriage' technique for marbling clay, creating his own version; a sort of mille-feuille of thin layers of differently coloured clays which he would then throw and sometimes chisel. 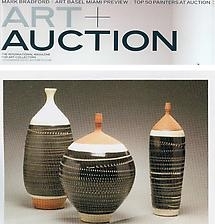 The collection of ceramics by the excellent 20th-century potter Kamoda Shoji at Joan B. Mirviss is a notable highlight. An added bonus: The pieces have never been shown outside of Japan. 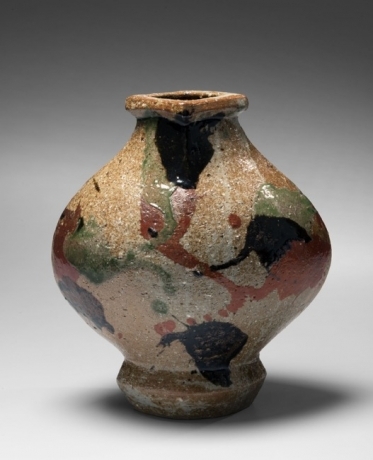 The collection of ceramics by the excellent 20th-century potter Kamoda Shōji at Joan B. Mirviss is a notable highlight. An added bonus: The pieces have never been shown outside of Japan. 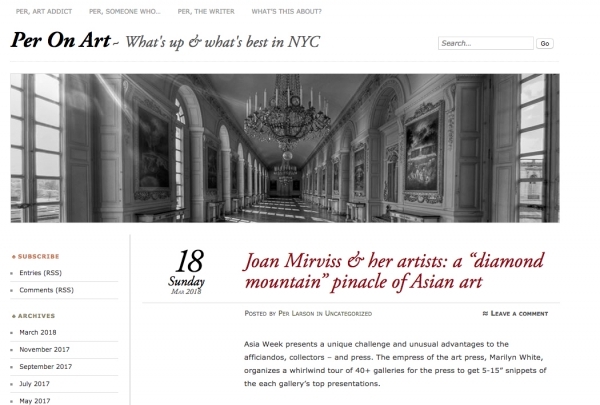 Joan discusses Asia Week New York and the current shift in art collecting. The first of three remarkable displays of contemporary Japanese ceramics that will be on view in the Gardiner lobby in 2018. 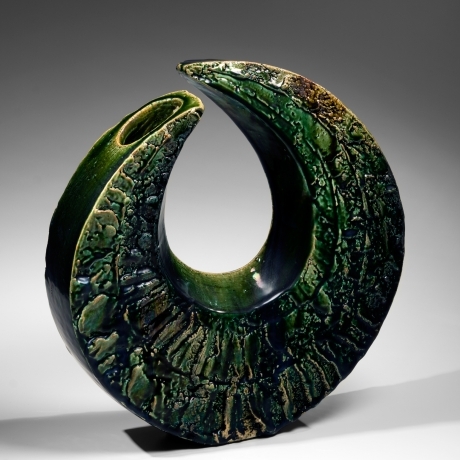 Curated by Joan B. Mirviss, an authority on Japanese ceramics and a New York City gallery owner for 40 years, these displays will showcase the stunning work of leading and emerging Japanese ceramic artists. 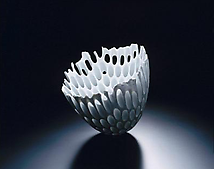 Japan Now: Form + Function features vessels created for floral display or referring, sometimes loosely, to that function. 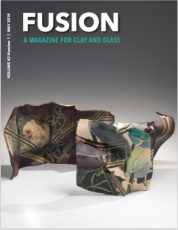 "After 40 years, Joan Mirviss' US gallery is a game-changer for young Japanese artists"
"Fujikasa's Stoneware Takes Flight" by Janet Koplos in "Ceramics: Art and Perception"
The inaugural Asia Week Contemporary is a huge success with a enthusiastic response from collectors. 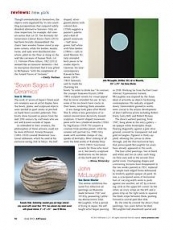 Joan B Mirviss LTD's exhibition, Ao: Colors of Nature in Blue+Green, presenting carefully selected Japanese art that explores the subtleties of ao, was featured in the online newspaper ArtDaily. Flow #1 by Fujikasa Satoko has been selected for The Poster Project at the Portland Art Museum and has become one of the most popular works viewed on the museum's website. 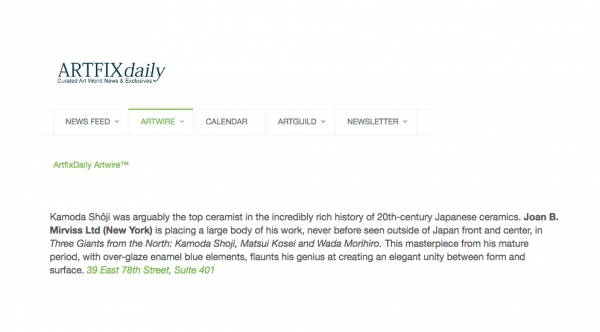 Joan B Mirviss LTD's exhibition, Waves of Ink: Painting in Porcelain, presenting the artwork of Kondo Takahiro was featured in the online newspaper ArtDaily. 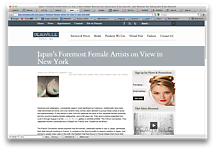 Waves of Ink: Painting in Porcelain, our upcoming exhibition of new works by Kondo Takahiro, is featured on the Fall Asia Week New York website. 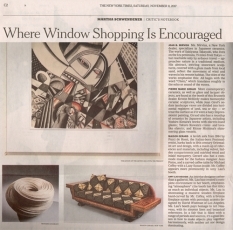 Long-time friend and client of Joan Mirviss LTD, Steven Korff, and his wonderful ceramic collection were featured in the New York Times. Akiyama Yō's major retrospective exhibition on view at the Musée Tomo in Tokyo from April 2 to July 24, 2016. 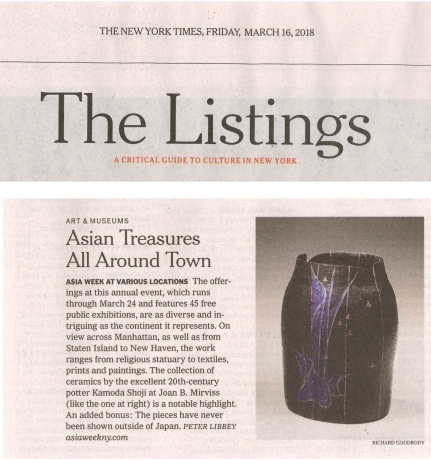 Water jar,by Kondō Takahiro, featured in New York Times article on Asia Week 2016. 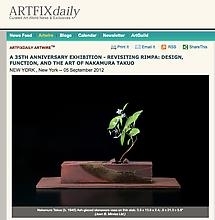 Sculpture by Fujikasa Satoko and more featured in the article Floating Earth. 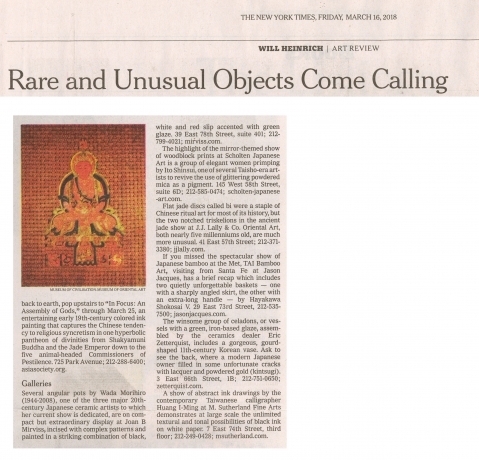 The Joan B Mirviss booth at the Winter Antiques Show was featured in the New York Times. Joan B Mirviss LTD is thrilled to announce that the Takashimaya Art Award, presented by the Takashimaya Cultural Foundation (Takashimaya Bunka Kikin), has been betowed upon Fujikasa Satoko. 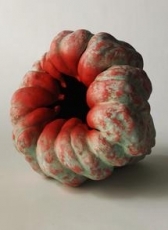 Katsumata Chieko's "Akoda," 2014, is featured in an exhibition called "Ceramix." 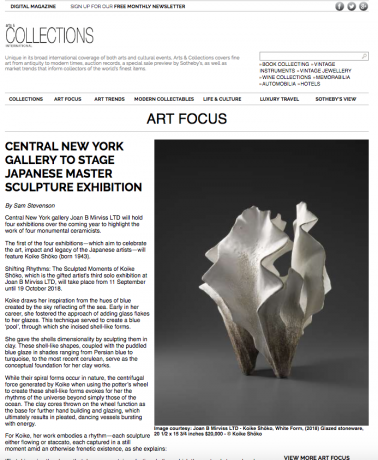 Press Release for Fujikasa Satoko's Exhibtion "Form in Motion" at Joan B Mirviss LTD. 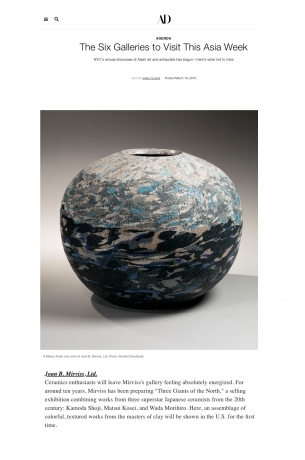 The Harn Museum will host an interactive artist workshop with JBM artist, Akiyama Yo, and feature a guest lecture by Joan B. Mirviss and noted collectors, Carol and Jeffrey Horvitz. 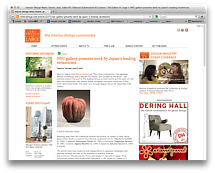 "This exhibition celebrates selected works of contemporary Japanese ceramics from the Paul and Kathy Bissinger Collection of San Francisco. 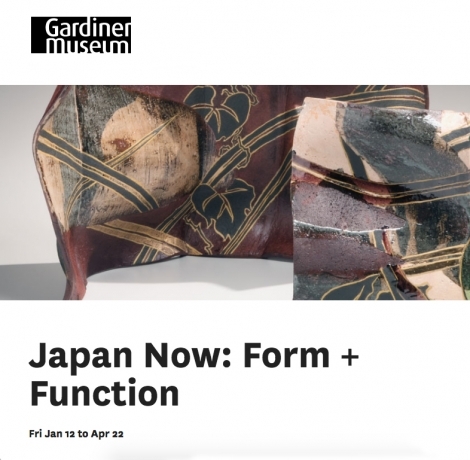 Works displayed here demonstrate how Japanese artists are continuing the long tradition of Japanese ceramics, even as they depart from the traditional in search of the new." 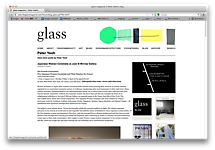 To download a copy of the article,click here. 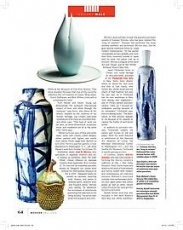 JBM artist Miwa Ryōsaku has made the list of artists featured in a look at 10 cool trends in contemporary ceramics. 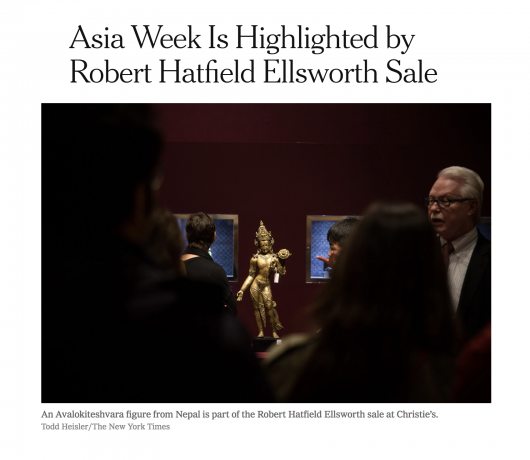 Asia Week New York—the nine-day Asian art extravaganza—ended on a stupendous note: $200 million in sales, exceeding last year’s number by $25 million. 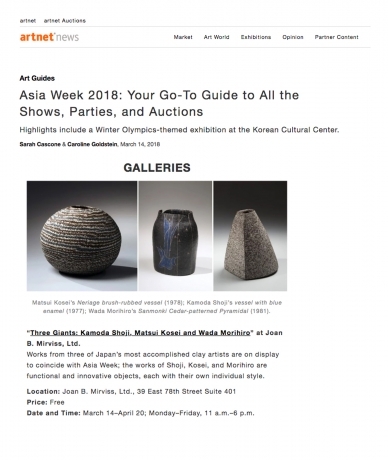 From the minute the 47 international galleries of Asia Week New York opened their doors on March 14, a whirlwind of activities invigorated the city. 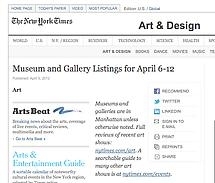 The annual event was celebrated with a magnificent reception at the Metropolitan Museum of Art on March 17, where the United Nations Secretary General Ban Ki-moon welcomed more than 600 collectors, curators and Asian art specialists. The event ignited excitement that burned for the entire week, and the Asian art world buzzed with exhibitions and record-breaking auctions that were thronged with international buyers from mainland China, Taiwan, India, Japan, Korea and the United States. 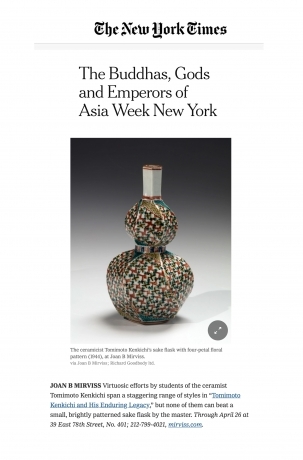 Manhattan dealer, Joan B. Mirviss, who specializes in Japanese ceramics and art, is hosting an exhibition titled The Eight Winds: Chinese Influence on Japanese Ceramics.To see a full PDF of the article, click here. 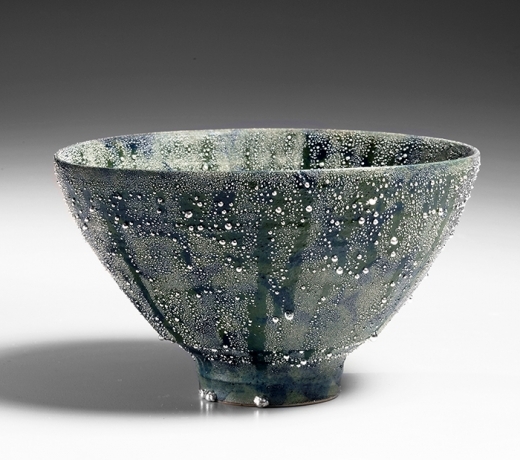 One of the most representative potters of post-war Japan, SUZUKI Osamu (1926－2001) was born in the Gojo-zaka district of Kyoto, as the third son of the pottery wheel worker SUZUKI Ugenji, who worked for the Eiraku-kobo atelier, one of the ten craftsmen families for the House of Sen.
We're excited to share the news that Itô Hidehito was announced as the winner of the Grand-Prix award at the Paramita Ceramic Competition on August 11, 2013. "During the 1930s the Toledo Museum of Art introduced modern Japanese prints to American audiences with two landmark exhibitions. These seminal shows featured the works of 15 contemporary Japanese artists who had revived the traditional art of the woodblock print for a new era. 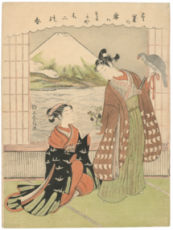 Fresh Impressions: Early Modern Japanese Prints reassembles and reinterprets the 1930 show and adds companion objects depicted in the prints such as kimonos, netsuke, and samurai swords." NEW YORK, NY.- Joan B. Mirviss Ltd presents the exhibition Out of the Fire: Sultry Ceramics, featuring 20 renowned Japanese artists representing the major traditions of Japanese wood-fired ceramics: Bizen, Hagi, Iga, Karatsu, Mino, Shigaraki, Tamba and Tokoname. In modern times, as electric and gas kilns have largely replaced wood-burning kilns, these artworks, born of the heat generated by wood-fired kilns, are especially seductive and stunning. It is the very nature of a wood-burning kiln to be essentially unpredictable. Maintaining the high temperature required to fire ceramics necessitates consistent feeding of the fire over an extended period of time; and the interior temperature and conditions vary depending on the location inside the kiln. Not only does this make the process of wood firing more time-consuming, but it also requires knowledge of the intricacies of each personally built anagama (single-chambered sloped tunnel) or noborigama (multi-chambered climbing) kiln. Placement within a kiln has a tremendous impact on its surface. 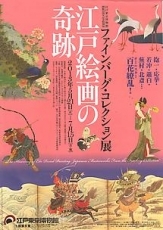 The Feinberg Collection has briefly returned to Japan, where it is on display at the Edo Tokyo Museum. To download a PDF of the brochure, click here. 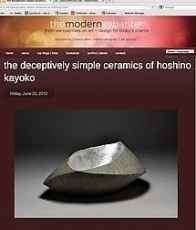 The work of seven of Japan’s finest mod- ern ceramists was on artful display here. Tea bowls, plates, and sculptural objects were nestled in quiet nooks or perched on hand-hewn wooden pedestals. 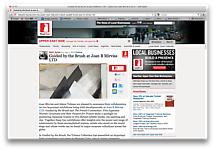 This lovely show focused on pieces from the mid-20th century by craftsmen who are not well known outside of Japan. A look at Ajiki Hiro's first US solo exhibition, right here at Joan B Mirviss Ltd.
Asia Week New York Art Shows Take Over Upper East Side. 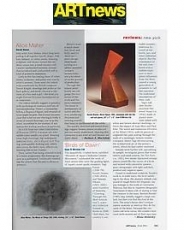 1stdibs.com has written profiles of the individual galleries participating in Asia Week, including Joan B. Mirviss Ltd. Click here to read the article. 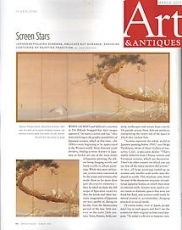 Japanese folding screens, delicate but durable, enshrine centuries of painting tradition click to view. 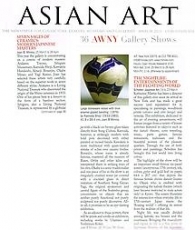 We are mentioned in the article "Pan-Asian Fusion," which focuses on great galleries to visit for Asia Week 2013. 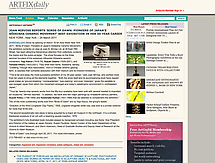 Download a PDF of the article here. 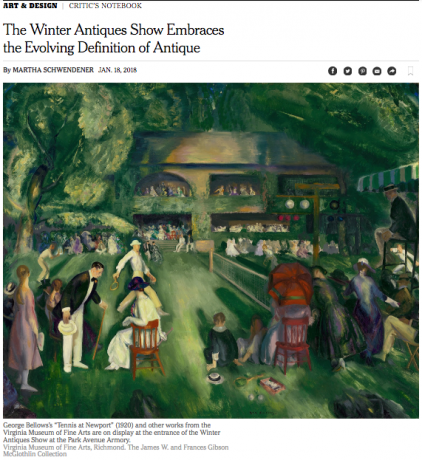 Joan B. Mirviss' feature ad for the annual Winter Antiques Show of 2013. 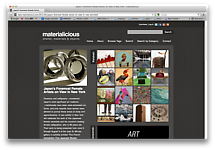 How do artworks and furniture from the 16th century to the present get into museums? Most international survey museums were built upn the existing collections of aristocrats or the donations of wealthy patron. 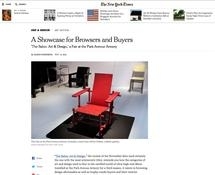 But new acqusitinons often go through art dealers, and an art fair like The Salon: Art + Design is the kind of place where you might see a few before they find institutional homes. Have any artists ever, anywhere, caught the hello-ness of spring and the farewell-ness of autumn more sweetly and sharply than the Rimpa painters of Japan? Two shimmering fall exhibitions, one at Japan Society and the other at the Metropolitan Museum of Art, argue persuasively that no, no artists ever have. 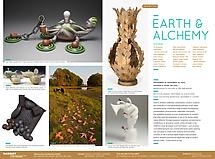 Earth & Alchemy opens at MassArt's Stephen D. Paine Gallery on Monday, September 24th. Gallery doors open for viewing at noon. At 6pm there will be a public reception. 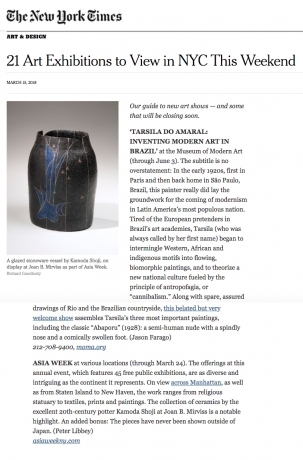 The works of Nakamura Takuo, born in 1945, are the sole subject of this exhibition which is timed to coincide with the exhibitions at the Metropolitan Museum of Art and at Japan Society. 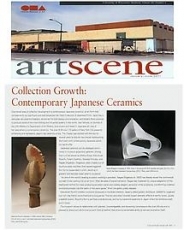 The ceramics will include freestanding sculptural and functional vessels that incorporate the uniquely Japanese painting aesthetic known as Rimpa, sometimes spelled these days as Rinpa. 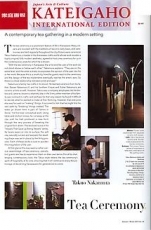 Because of his strength of form, copacetic decoration and excellence of execution, Nakamura's work can be found in the collections of the Metropolitan Museum of Art, the Art Institute of Chicago, and the 21st Century Museum of Contemporary Art in Kanazawa. 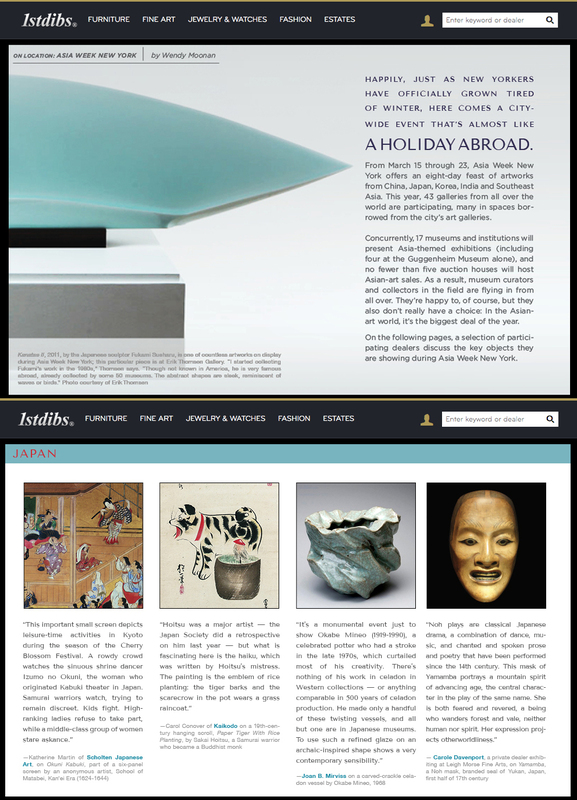 This autumn marks the thirty-fifth year Joan B Mirviss LTD has been a leader in the field of Japanese fine art. In celebration of this momentous occasion, we are pleased to present the first of several remarkable exhibitions. 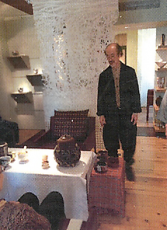 The tea ceremony is a prominent feature of life in Kanazawa. Many citizens are involved with the traditions of tea on a daily basis, and ceremonies are held regularly throughout the city. 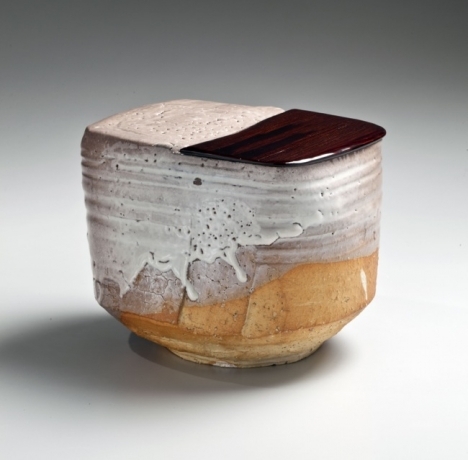 Kutani-ware ceramicist Takuo Nakamura, a leader in the Kanazwa crafts world whose work exudes a highly original, fully modern aesthetic, agreed to host a tea ceremony for us in the contemporary style for which he is known. 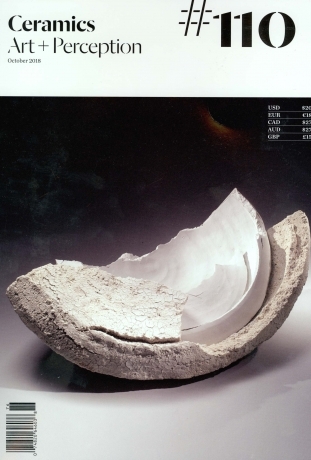 Tai Gallery has a Japanese ceramics show with works from a broad mix of contemporary ceramicists as well as a show within itself, Desert Bloom, of Fujino Sachiko's work. On the Avant Garde of Japanese pottery, the collective offers clay in all different shapes and sizes but which consistently maintain the core structure of vessel. 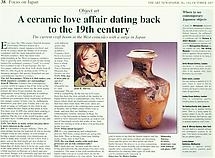 Until recently, Japanese ceramic art has been a male-dominate field, with women forbidden even to touch a kiln. My first impression of Kayoko’s ceramics was that of a double take. At a first glance, the simple ceramics look like carved rocks but how could they be if the label is calling them ceramics? Then on closer inspection one quickly adjusts the eye with the rational to appreciate beautiful contemporary ceramics made by a gifted artist. The French Connection: Five Japanese women ceramists and their passion for France at Joan B. Mirviss Ltd.
NEW YORK, NY.- This exhibition titled The French Connection: Five Japanese Women Ceramists and their Passion for France, explores the dramatically increasing importance of Japanese women artists in the current ascendency of contemporary Japanese ceramics on a global stage and focuses on how their relationships to France have influenced, and indeed enabled, the five show-cased artists to find their unique voices. Stifled at one time or another by Japan’s restrictive view in the role of women and the lack of freedom with regard to their career choices, especially in the arena of ceramics, these committed female artists have successfully overturned such limitations by choosing to train/study/work/live abroad, particularly in Paris. Maintaining professional and personal contacts with both countries, they have managed to succeed in ways unavailable to their male colleagues. 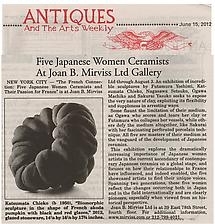 New York City - "The French Connection: Five Japanese Women Ceramists and Their Passion for France" is at Joan B. Mirviss Ltd through August 3. An exhibition of incredible sculptures by Futamura Yoshimi, Katsumata Chieko, Nagasawa Setsuko, Ogawa Machiko and Sakurai Yasuko seeks to expose the very nature of clay, exploiting its flexibility and suppleness in arresting ways. "Women ceramists in Japan often confront insurmountable barriers when pursuing their career in an artistic industry regulated by an entrenched succession system of craftsmen transferring skills (and businesses) to their male heirs. Many women ceramists, disenfranchised by the rigid patriarchal system, opt to leave home to hone their craft and build their oeuvres abroad. Impressive works by five Japanese women who have done just that are currently the focus of an enlightening exhibition at the Joan B Mirviss Gallery, an exquisite space in the Upper East Side of New York. The well-crafted show, titled "The French Connection: Five Japanese Women Ceramists and Their Passion for France," showcases works by Futamura Yoshimi, Katsumata Chieko, Nagasawa Setsuko, Ogawa Machiko, and Sakurai Yasuko – all established their reputation through their shared love for France." For centuries, women in Japan were not even permitted to touch a kiln, lest their "impurity" taint whatever was baking. Yet in the past decade, women clay artists have come to outnumber men in Japan's art schools, and the next generation of master ceramists is shaping up to be disproportionately female. "Ceramics and calligraphy—considered Japan’s most significant art mediums—traditionally have been male-dominated art forms, and only recently have women been allowed to pursue these areas of study and apprenticeship. A new exhibit in New York will celebrate the work of five Japanese female ceramists and the country’s leading female calligrapher, who is 99 years old. 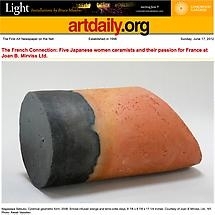 Their work is being presented from June 5 through August 3 at the Joan B. Mirviss gallery in exhibits entitled 'The French Connection: Five Japanese Women Ceramists and a Passion for France' and 'Guided by the Brush.' "
"This exhibition titled THE FRENCH CONNECTION: FIVE JAPANESE WOMEN CERAMISTS AND THEIR PASSION FOR FRANCE, explores the dramatically increasing importance of Japanese women artists in the current ascendency of contemporary Japanese ceramics on a global stage and focuses on how their relationships to France have influenced, and indeed enabled, the five show-cased artists to find their unique voices. Stifled at one time or another by Japan’s restrictive view in the role of women and the lack of freedom with regard to their career choices, especially in the arena of ceramics, these committed female artists have successfully overturned such limitations by choosing to train/study/work/live abroad, particularly in Paris. Maintaining professional and personal contacts with both countries, they have managed to succeed in ways unavailable to their male colleagues. These women have come to this life-style via varied routes, some working exclusively in France while others have studios in both countries and still another works exclusively in Kyoto after years in Limoges. Spanning two generations, these five women reflect the changes occurring both in Japan and in the field internationally. 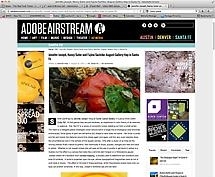 But all are clearly pioneers especially when in viewed from an historical perspective." "Joan Mirviss and Alison Tolman are pleased to announce their collaboration on two important exhibitions being held simultaneously at Joan B Mirviss LTD. Guided by the Brush and The French Connection: Five Japanese Women Ceramists and their Passion for France shine a spotlight on pioneering Japanese women in two distinct artistic media: ink painting and clay. Together these two exhibitions offer insights into the power and range of achievement by these accomplished women, artists who stand on the world stage and whose works can be found in major museum collections across the globe." " Ceramics and calligraphy—considered Japan’s most significant art mediums—traditionally have been male-dominated art forms, and only recently have women been allowed to pursue these areas of study and apprenticeship. 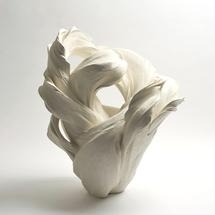 A new exhibit in New York will celebrate the work of five Japanese female ceramists and the country’s leading female calligrapher, who is 99 years old. 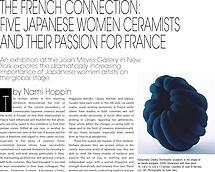 Their work is being presented from June 5 through August 3 at the Joan B. Mirviss gallery in exhibits entitled 'The French Connection: Five Japanese Women Ceramists and a Passion for France' and 'Guided by the Brush.' 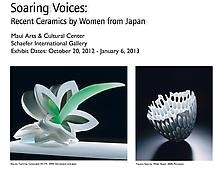 "
Soaring Voices: Recent Ceramics by Women From Japan, the seminal exhibition which has been touring since 2009, will have its final installation at the Maui Arts and Cultural Center, Schaefer International Gallery in Hawaii. Guest speakers include: Joan Mirviss, David Kuraoka (moderator), Hiroko Miura (Curator of Museum of Contemporary Ceramic Art, Shigaraki Ceramic Cultural Park), Maya Nishi, Anne Morse (Senior Curator of Japanese Art, Museum of Fine Arts, Boston), Halsey and Alice North. 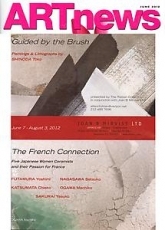 Guided by the Brush: Paintings and Lithographs by SHINODA Toko and The French Connection: Five Japanese Women Ceramists and their Passion for France. "Unfamiliar landscape prints by familiar names – mainly Katsushika Hokusai and Utagawa Hiroshige – dominate this lavish show, and their superb condition has kept the colors strikingly vivid. 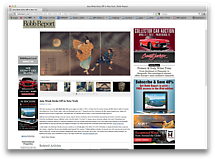 The grandly descriptive can turn grandly abstract on a dime, especially when Hokusai tackles waterfalls in vertical formats. Also noteworthy are the prints of his lesser-known cotemporary Keisai Eisen, whose inclination to give tumbling water the solidity of nearby rocks has a bracing visionary force." 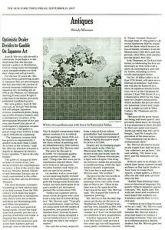 "The overall exuberance and acquisitive atmosphere were reminiscent of Asia Weeks of the late 1990s," said Joan Mirviss, who reported that the response from collectors and enthusiasts to her exhibition "Approaching the Horizon: Important Japanese Prints from the Collection of Brewster Hanson" was exhilarating. "By the close of Asia Week's openhouse weekend, we had sold nearly 60% of the exhibition (which included sixty-eight prints). In terms of attendance and participation, this year's Asia Week was tremendous and far exceeded those in recent memory." 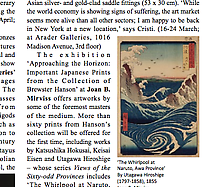 New York City - In Conjunction with Asia Week New York, Joan B. Mirviss Ltd is presenting "Approaching the Horizon: Important Japanese Prints from the Collection of Brewster Hanson," an exhibition of particularly fine impressions of some of the most coveted designs of Hiroshige, including masterworks by Hokusai, Eisen and Yoshitoshi. 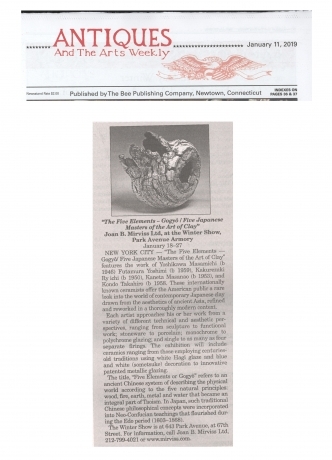 "At the Joan B. Mirviss gallery on the Upper East Side, the dealer is selling the collection of Brewster Hanson, a lifelong fan of Japanese art, who died in 2008. At the time Hanson was collecting prints, his tastes were supposedly more Japanese than European, meaning he obtained many rare, top-quality prints without competition, according to Mirviss. However, the pendulum has swung, it seems. 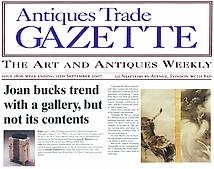 Before the show even opened Mirviss reported that half of the catalogue had been sold, mostly the more expensive (and more rare) prints." New York never lacks for art, but as spring approaches, movable feasts of it seem to arrive in waves. 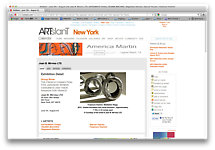 Last week nearly a dozen fairs put exra servings of contemporary and Modern art on the table. 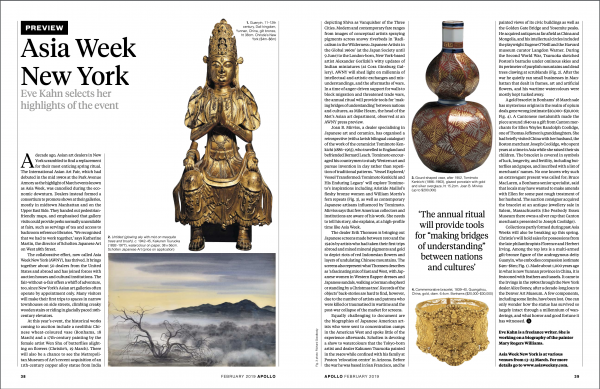 Friday is the official beginning of Asia Week, a visual repast of more than 40 shows staged by New York and out-of-town dealers and spread mostly through galleries around the Upper East Side, on or just off Madison Avenue. 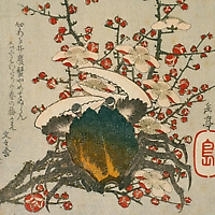 This is an exhibition of particularly fine impressions of some of the most coveted designs of Hiroshige, including masterworks by Hokusai, Eisen and Yoshitoshi. Prints from the Brewster Hanson Collection were assembled from acquisitions made around the world. 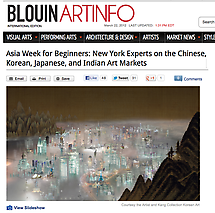 "Asia Week New York 2012 retains a similar format to that seen last year and again comprises dozens of special events and exhibitions. The ‘Asia Week’ group (AWNY) is made up of more than thirty galleries, and involves five auction houses – Christie’s, Sotheby’s, Bonhams, Doyle New York and iGavel – and several museums and Asian cultural institutions (16-24 March; for further information and a detailed calendar and map of events, see www.asiaweekny.com). " 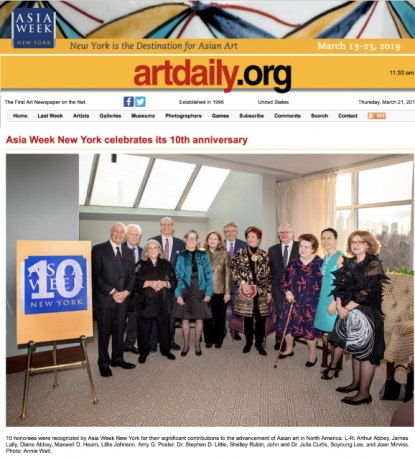 "With each successive year, Asia Week New York grows bigger and better. 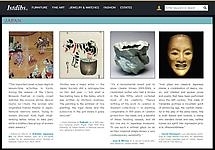 In 2012, no fewer than five auction houses will offer relevant sales of artworks and artifacts from China, Korea, Japan, India, and Southeast Asia, and 17 museums and other institutions will offer special programming. 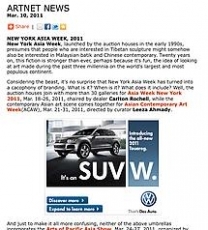 Indeed, the festivities cannot fit within a single week—Asia Week New York officially starts on March 16 and continues through March 24." 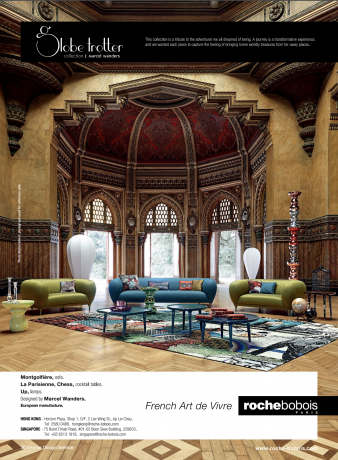 "Each year, more and more designers and their clients recognize how well Asian art and antiques complement diverse interiors. 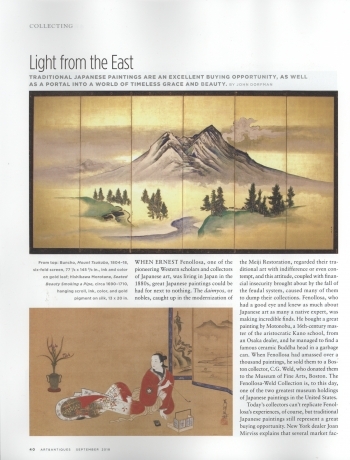 According to Joan Mirviss, a Japanese art specialist and participant in Asia Week New York, both private clients and professional designers are placing Japanese screens, ceramics, and woodblock prints in very different interiors-those with English or French eighteenth-century furnishings as well as one with Modernist or contemporary furniture. Says Mirviss: 'The purity of line, the expression of asymmetry, the focus on simplicity, the remarkable palette-all these elements make Japanese art and antiques such becoming counterparts to nearly every style of interior design.' 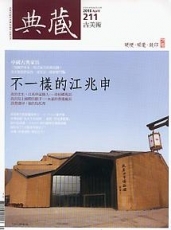 "
A touring exhibition including our artists: Fukumoto Fuku, Fujino Sachiko, Katsumata Chieko, Kishi Eiko, Kitamura Junko, Koike Shoko, Mishima Kimiyo, Sakurai Yasuko, Shimizu Sachiko and Tashima Etsuko. 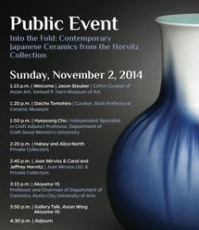 Western and Japanese potters have influenced one another at least since the 1940s. Artisans on various continents have painted Pop Art checkerboards on traditional tea-bowl forms and used ancient raku firing techniques on jokily unusable perforated vases. 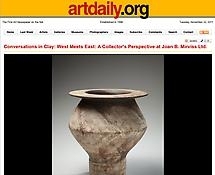 “Conversations in Clay — West Meets East: A Collector’s Perspective,” an exhibition through Jan. 6 at the Joan B. Mirviss gallery in Manhattan, pairs about 30 Japanese pieces from the gallery’s inventory with American and European counterparts (with prices mostly a few thousand dollars each). "Beauty in All Things: Japanese Art and Design"
The Museum of Art and Design has put together a selection from its permanent collection for a show entitled, "Beauty in All Things: Japanese Art and Design" which includes some of our artists: Kondo Takahiro, Kishi Eiko, Koike Shoko, Kohyama Yasuhisa, Sakiyama Takayuki, Imai Hyoe and Yoshikawa Masamichi. 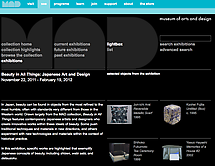 Visit the museum's website for further information. 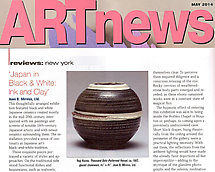 NEW YORK, N.Y.- For the first time since Joan B. Mirviss Ltd. began representing Japanese ceramics in the mid '80s, Western artists will be presented together with their Japanese counterparts in this intimate exhibit entitled Conversations in Clay – West Meets East: A Collector's Perspective. 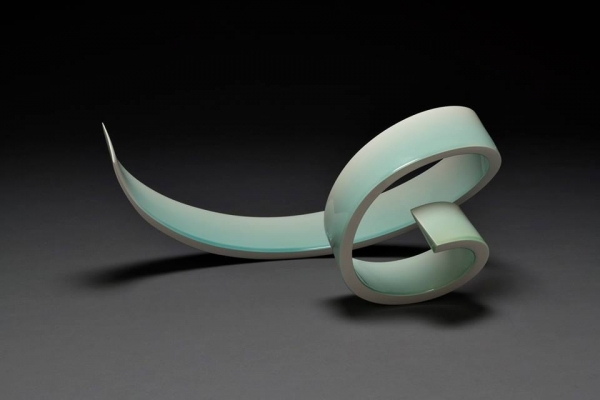 The show, curated by Steven Korff in collaboration with Joan Mirviss, finds its inspiration in Korff's integrated collection of ceramic art that includes important artists from both backgrounds, from Hamada Shôji to Hans Coper, Carlo Zauli to Akiyama Yô. 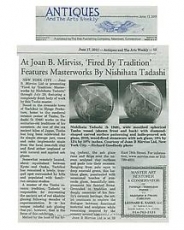 "Joan B. Mirviss Ltd is presenting "Fired by Tradition: Masterworks by Nishihata Tadashi" through July 29, featuring a completely fresh body of work by this Tanba master. Based in the riverside town of Tachikui in Hyogo Prefecture, home to the medieval ceramic center of Tanba, Tadashi (b 1948) works in the centuries-old traditions of his ancestors. As one of the six ancient kilns of Japan, Tanba has long been celebrated for its simple storage jars, vases and sake implements made from the local iron-rich clay and fired either unglazed or with natural and applied ash glazes. This beautifully curated show, subtitled "Pioneers of Japan's Sodeisha Ceramic Movement," celebrated the work of three artists who were the guiding lights of Japan's avant-garde ceramists. Yagi Kazuô (1918-79), Suzuki Osamu (1926-2001) and Yamada Hikaru (1923-2001) were founders of Sôdeisha ("Crawling Through the Mud Association"), a pottery collective formed in Kyoto in 1948. Until then, the country's venerable ceramics traditions focused on tea bowls, jars, and other utilitarian objects. 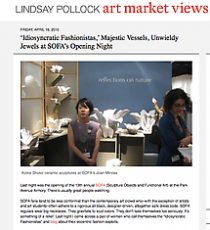 The 14th annual Sculpture Objects & Functional Art Fair at the Park Avenue Armory enjoyed steady crowds and sales, from the well-attended vernissage on April 13 straight through its four-day run, which ended on Sunday, April 17. 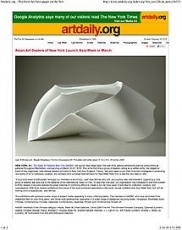 An estimated 2000 persons attended Opening Night throughout the course of the evening, and an after-preview benefit dinner in the Armory's Tiffany Room for the Museum of Arts & Design (MAD) honoring Judy Cornfield was a sell-out. MAD also sponsored the new MAD Den Video Lounge designed by NY architect/designer David Ling, adding yet another media to the stimulating mix of art and design at the fair. 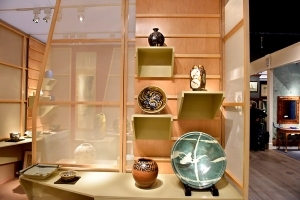 One newer area of collection development is contemporary Japanese ceramics, an art form that complements our significant and well-respected Van Vleck Collection of Japanese Prints. Japan has a centuries-old ceramics tradition, renowned for both beauty and innovation, and potters there continue to produce some of the most striking and influential pottery in the world. Joan Mirviss, an alumna of the UW-Madison's Department of Art History, is an expert and dealer in Japanese art; one of her specialties is contemporary ceramics. Joan B. Mirviss, Ltd, will present a major solo show of internationally acclaimed artist Akiyama Yo (b 1953) who lives, works and teaches in Kyoto, Japan. 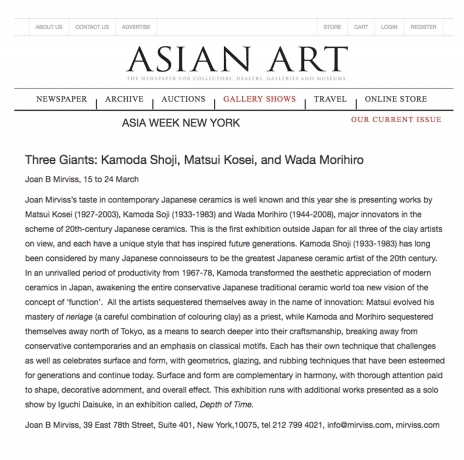 This exhibition, on view April 18-May 20, will be Japan's highly acclaimed artist's second in the United States. 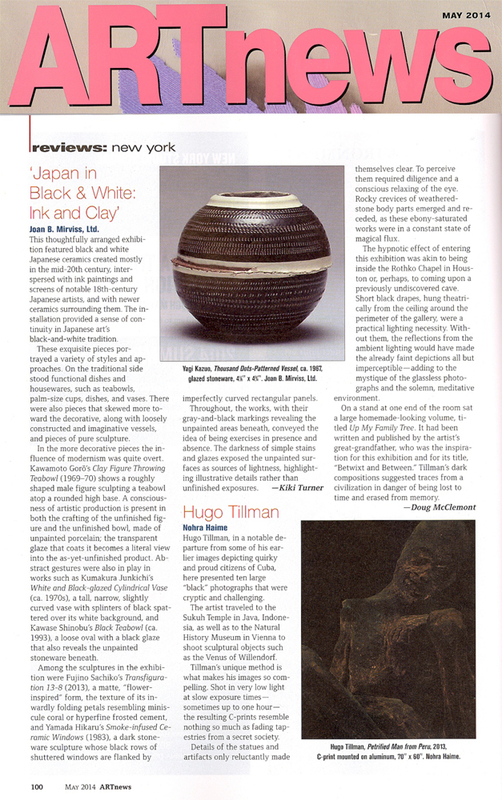 "Tension and Transition" includes more than ten sculptural clay works created for this presentation. 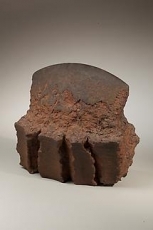 Though using a basic stoneware clay, Akiyama's aesthetic pushes past any traditional concepts for ceramics; his art has much more in common with the work of contemporary sculptors like Richard Serra than the utilitarian ceramics for which Kyoto is historically known. At that same masterly level, a hand-thrown group of remarkably sculpted, unglazed stoneware by Kyoto's Akiyama Yo at Joan B. Mirviss Gallery of New York, made it almost worth the $25 price of general admission. Suffused with iron powder and vinegar, the wheel-thrown pieces undergo an ever-changing patina of corten-steel like rusty colors as they oxidize. It makes one think of Richard Serra, but on a smaller and safer scale. 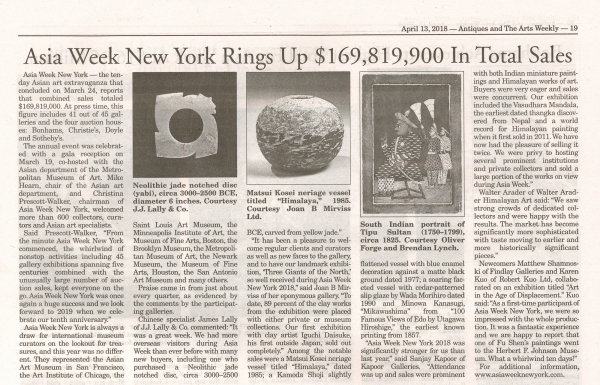 Collectors, curators, scholars and Asian art enthusiasts from around the world convened for Asia Week New York 2011 in March—nine days of exhibitions, private sales, public auctions, special events and fund-raising, spending more than $250 million on Asian art. 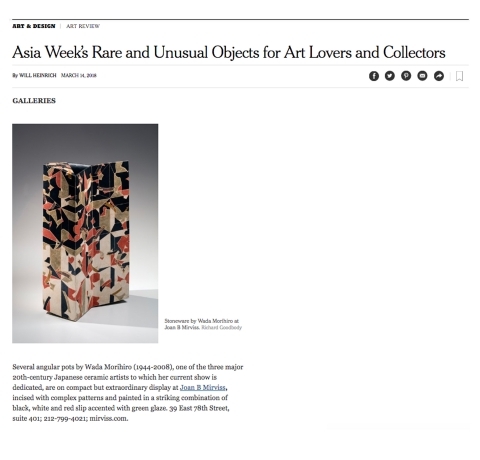 Complementing Asian exhibitions at 18 New York-area museums and cultural institutions were thousands of ancient through contemporary Asian works of art at 5 leading auction houses and at the venues of 34 Asian art specialists exhibiting in New York. Dealers from the U.S. and abroad reported double and triple the attendance over last year with strong sales to collectors and institutions based in the United States, Europe, Hong Kong and mainland China with many works on reserve by museums. In the hours following the March 11 earthquake in northeast Japan, the New York-based nonprofit Japan Society launched an earthquake relief fund. Since then, donations to the fund have come in bit by bit from all corners of the city. Nahoko Sugiyama and Kashimi Asai, alumnae of Dance New Amsterdam, organized a benefit dance performance with other graduates on March 20. The organization donated the theater space and the technical crew donated their time. The dancers donated $4,070 on Wednesday. DJ Tadaaki Iwaki and pop-and-lock street dance performer Kenichi Ebina organized a performance and contributed $3,398; a stoop sale and bake sale held by Japanese moms in Brooklyn raised $3,800; a swing dance group organized by Japanese women held a "Swing for Japan" fund-raiser and contributed $5,700 to the fund. It's hard to think about art in the face of nightmarish human tragedy. As Japan attempts to get back on its feet after the March 11 earthquake and tsunami, news on the nation's contemporary structures and historic sites trickles in. Eiji Mizushima of the Japan committee of the International Council of Museums (ICOM) has sent out e-mail updates as information becomes available. 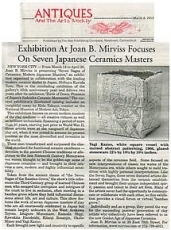 Since its opening on March 16 for Asia Week New York 2011, "Birds of Dawn: Pioneers of Japan's Sôdeisha Ceramic Movement," the exhibition currently on view at Joan B. Mirviss Ltd. at 39 East 78th Street, has been attracting tremendous attention from collectors, curators, the media and the public-at-large. The show focuses on the three seminal founders of the extremely influential Sôdeisha ceramic movement: Yagi Kazuo (1918-79), Suzuki Osamu (1926-2001), and Yamada Hikaru (1923-2001). 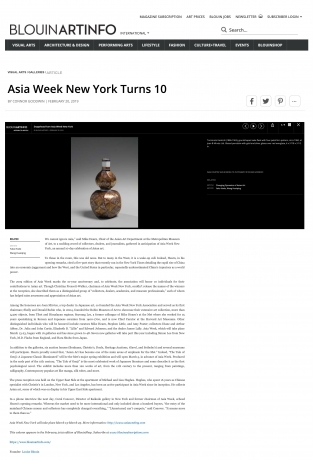 Acting in an unprecedented collaboration, more than 30 prominent Asian art specialists, 5 auction houses and 18 museums and Asian cultural institutions in the metropolitan New York City area will join forces to present Asia Week New York 2011, taking place from March 18-26. 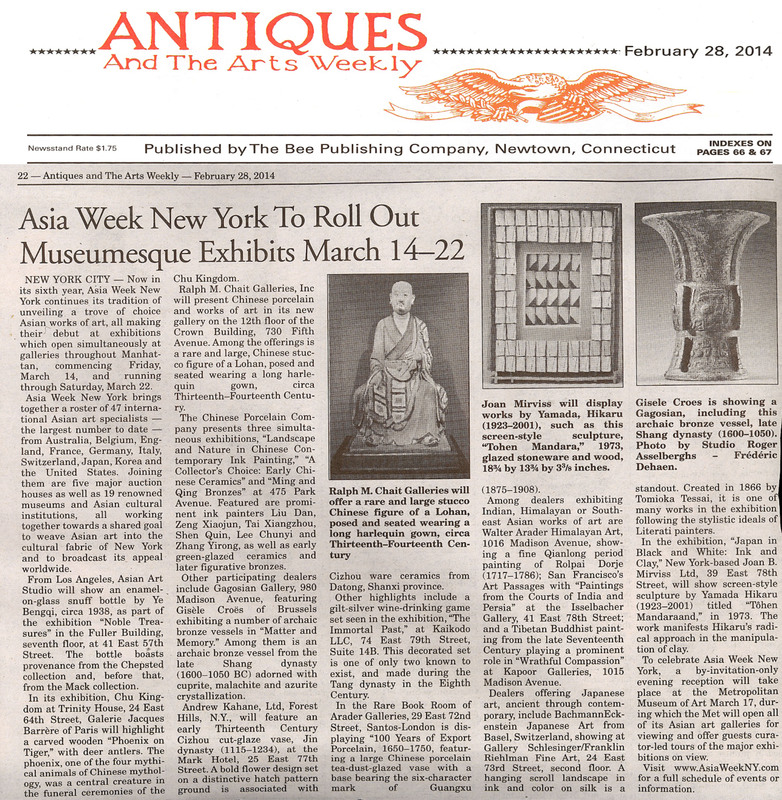 Not so long ago Manhattan’s annual spring Asia Week was feeling diminished. 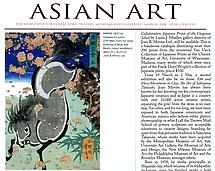 The Asian Art Fair had folded. Gallery shows were scattered around town. Collective energy was low. 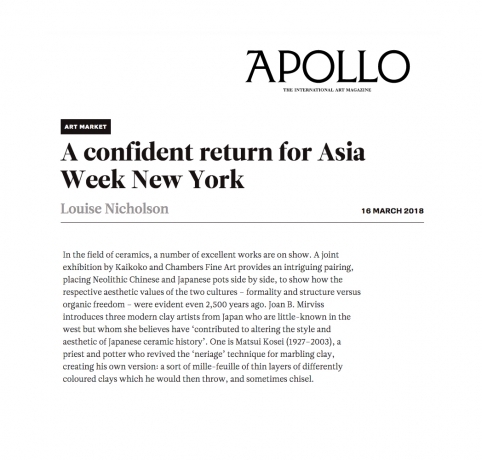 Not so long ago Manhattan’s annual spring Asia Week was feeling diminished. The Asian Art Fair had folded. Gallery shows were scattered around town. Collective energy was low. 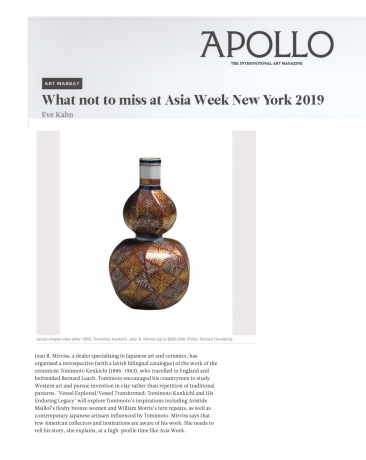 More than 60 works from Japan’s Sôdeisha Ceramic Movement will be on display at New York’s Joan B. Mirviss Ltd art gallery on East 78th Street from March 16 through April 29 to coincide with Asia Week New York 2011. 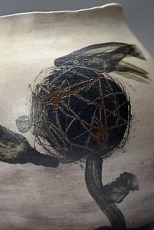 The exhibition, titled Birds of Dawn, showcases the unique work of artists Yagi Kazuo, Suzuki Osamu, and Yamada Hikaru. 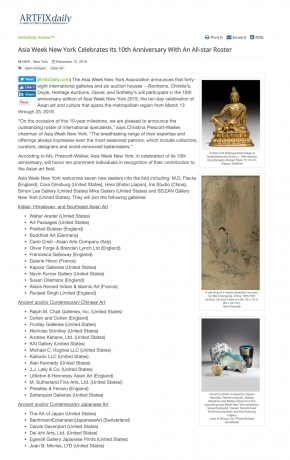 New York Asia Week, launched by the auction houses in the early 1990s, presumes that people who are interested in Tibetan sculpture might somehow also be interested in Malaysian batik and Chinese contemporary. Twenty years on, this fiction is stronger than ever, perhaps because it's fun, the idea of looking at art made during the past three millennia on the world's largest and most populous continent. Over ten years in the making, Joan Mirviss Ltd presents “Birds of Dawn: Pioneers of Japan’s Sôdeisha Ceramic Movement,” which opens on March 16, 2011, at 39 East 78th Street in New York.This exhibition, which coincides with Asia Week New York, will focus on three seminal founders of this extremely influential movement: Yagi Kazuo (1918-79), Suzuki Osamu (1926-2001), and Yamada Hikaru (1923-2001). More than sixty works by this Kyoto triumvirate will be on view and offered for sale. Asia Week gets off to an auspicious start March 18 with an elegant reception at the Asia Society. Then, over the course of nine days, 34 Asian art dealers—along with the Asia Society, Japan Society, Rubin Museum, China Institute and the auction houses Bonham’s, Christie’s, Sotheby’s, Doyle New York and iGavel—will present exhibitions, lectures, discussions, sales, concerts, films and a gala benefit reception and dinner, with everything open to the public. The range is astonishing. Asia Week New York 2011 is an unprecedented collaboration among Asian art specialists, 5 auction houses and 18 museums and Asian cultural institutions in the metropolitan New York area from March 18-26, 2011. Simultaneous exhibitions presented by 34 prominent Asian art dealers from the U.S and abroad, auctions at Bonhams, Christie's, Sotheby's, Doyle New York and iGavel, as well as dozens of special events are planned for this period. Incorporating five auction houses and 17 museums and Asian cultural institutions, this year's Asia Week also showcases specially-curated exhibitions at nearly three dozen galleries. 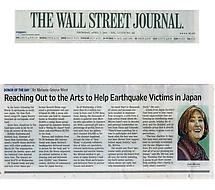 In addition, the Japan Society is pleased to announce the Japan Earthquake Relief Fund. The Japan Society has created a disaster relief fund to aid victims of the Tohoku earthquake in Japan. Over the years, Japan Society has partnered with several Japanese and American nonprofits working on the frontlines of disaster relief and recovery. 100% of your generous tax-deductible contributions will go to organization(s) that directly help victims recover from the devastating effects of the earthquake and tsunamis that struck Japan on March 11, 2011. 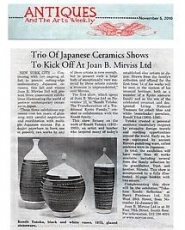 Over ten years in the making, Joan Mirviss Ltd presents "Birds of Dawn: Pioneers of Japan's Sôdeisha Ceramic Movement," which opens on March 16, 2011, at 39 East 78th Street in New York. This exhibition, which coincides with Asia Week New York, will focus on three seminal founds of this extremely influential movement: Yagi Kazuo (1918-79), Suzuki Osamu (1926-2001), and Yamada Hikaru (1923-2001). More than sixty works by this Kyoto triumvirate will be on view and offered for sale. 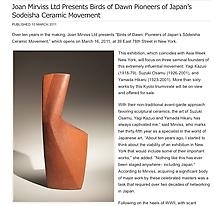 Over ten years in the making, Joan Mirviss Ltd presents “Birds of Dawn: Pioneers of Japan’s Sôdeisha Ceramic Movement,” which opens on March 16, 2011, at 39 East 78th Street in New York. This exhibition, which coincides with Asia Week New York, will focus on three seminal founders of this extremely influential movement: Yagi Kazuo (1918-79), Suzuki Osamu (1926-2001), and Yamada Hikaru (1923-2001). More than sixty works by this Kyoto triumvirate will be on view and offered for sale. 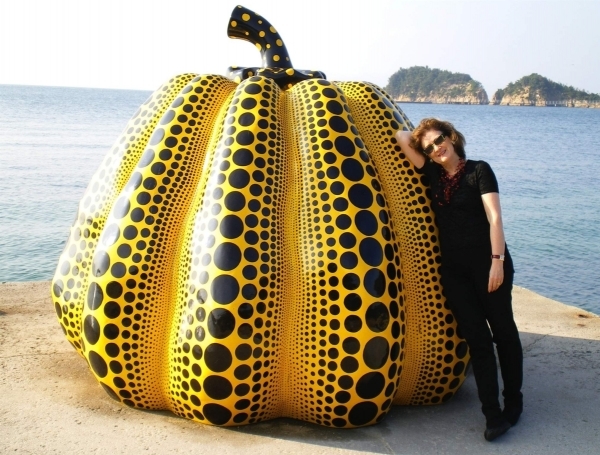 "With their non-traditional avant-garde approach favoring sculptural ceramics, the art of Suzuki Osamu, Yagi Kazuo and Yamada Hikaru has always captivated me,” said Mirviss, who marks her thirty-fifth year as a specialist in the world of Japanese art. 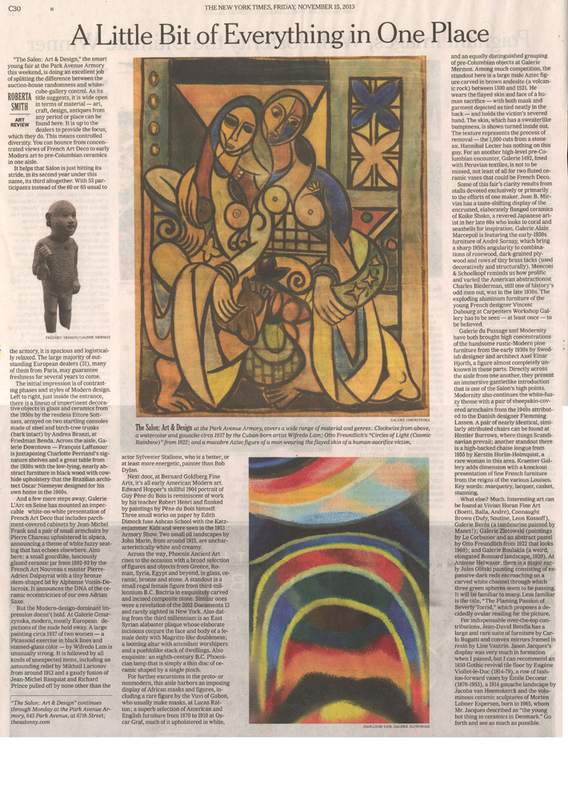 “About ten years ago, I started to think about the viability of an exhibition in New York that would include some of their important works,” she added. “Nothing like this has ever been staged anywhere– including Japan.” According to Mirviss, acquiring a significant body of major work by these celebrated masters was a task that required over two decades of networking in Japan. Joan B. Mirviss will present three consecutive exhibitions illuminating the world of post-war contemporary ceramics in Japan. This first show of over 40 works of art, focuses on the work of Kondô Yutaka (1932-83), a remarkable artist and gifted teacher who inspired many of today's established clay artists in Japan, who was the pivotal figure in his ceramic family before his untimely death. Drawn from the family's collection and offered for the first time, fourteen of his works will be seen in the context of his highly unusual heritage, both as a member of a Kyoto samurai family and as the son of the celebrated ceramist and designated Living National Treasure for cobalt blue-and-white (sometsuke) porcelain, Kondô Yûzo (1902-85). Over the next four months the New York dealer Joan Mirviss is presenting a crash course in postwar Japanese ceramics throw three shows of objects rarely seen in this country and fresh to the market. 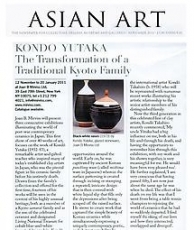 "Kondô Yutaka: The transformation of a Kyoto Family," running from November 10 through December 17 at Mirviss's East 78th Street gallery, looks at three generations of the storied Kondô clan of ceramists. 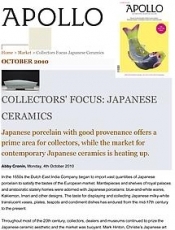 Japanese porcelain with good provenance offer prime area for collectors, while the market for contemporary Japanese ceramics is heating up. 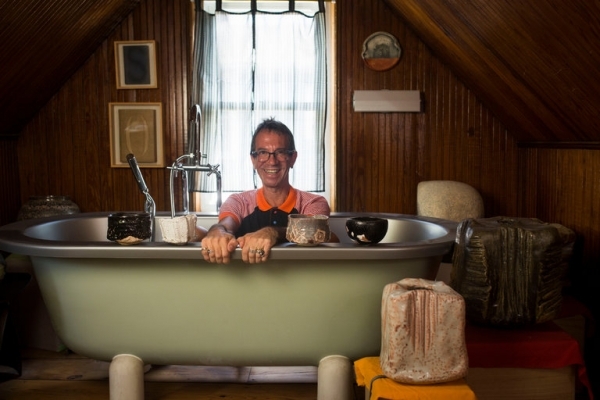 There's probably no better place to start collecting art than with ceramics. Comparatively, they are more economical to begin with. And just like prints and paintings, they are flexible even with themed decorating. With several artists rising to become popular ceramics painters, there are several selections that are a good place to start a collection. 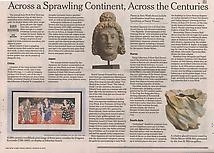 Conventional wisdom for the new collector used to be: "Start with prints and as you learn more, graduate to painting." 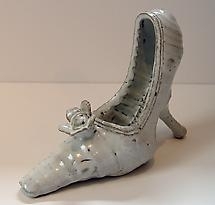 Today, on the contrary, another approach is build an art collection by acquiring ceramics. 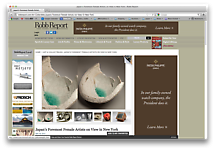 A good place to begin is the current show of sparkling and richly detailed enameled porcelain of Jun Takegoshi at the Joan B. Mirviss LTD gallery on New York's Upper East Side. 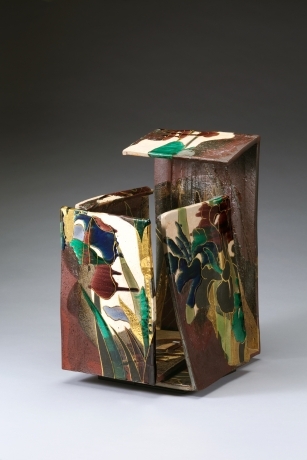 Takegoshi's (b.1948) polychrome enamel vessels won't send you to the bank for a second mortgage. Dealers and galleries at the second annual SOFA WEST: Santa Fe 2010 held July 8-11 at the Santa Fe Convention Center reported steady sales, most to new clients from all over the United States. Overall fair attendance climbed to 12,000 from 10,000 persons last year. 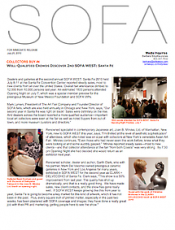 An estimated 1800 persons attended Opening Night on July 7, which was a special member preview for the prestigious Museum of New Mexico Foundation and SOFA VIPs. 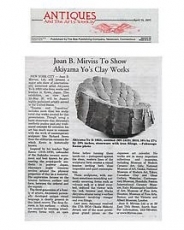 A tension between the old and the new can also be seen in the conceptual ceramic art of Japanese artist, Akiyama Yo, represented by Manhattan's Joan B Mirviss, Ltd., long-time SOFA exhibitor in New York, but new to SOFA WEST. 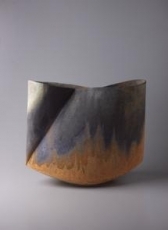 Widely considered to be one of the greatest ceramic artists living today, Akiyama was a member of the extremely influential Kyoto avant-garde group Sodeisha, which eschewed traditional Japanese ceramic functionalism in favor of modernist sculpture and contemporary abstraction. 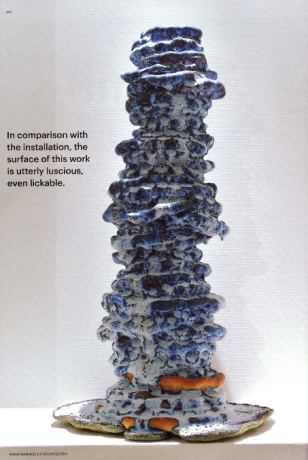 Mirviss says, "Akiyama's work is created with the theme of disintegration in nautre and how life returns to clay. 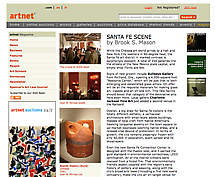 Santa Fe gears up for summer, its busiest season, with a packed schedule of art fairs and associated events. Even opening the fair on tax day did not scare off buyers. 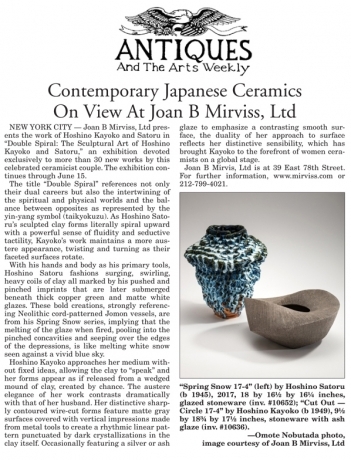 A stunning case in point—Joan Mirviss of Joan B. Mirviss Ltd., New York sold 23 pieces by the celebrated Japanese ceramicist Koike Shoko within 30 minutes of the show's opening. "Opening night was very strong," said Mirviss. 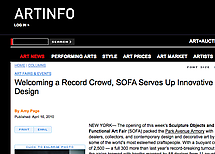 "In addition to SOFA's regular clients, there were many new faces who expressed serious and knowledgeable interest in what we presented. I could have sold my show twice and some pieces 2 or 3 times. It's the best SOFA I've had thus far." The opening of this week's Sculpture Objects and Functional Art Fair (SOFA) packed the Park Avenue Armory with dealers, collectors, and contemporary design and decorative art by some of the world's most esteemed craftspeople. 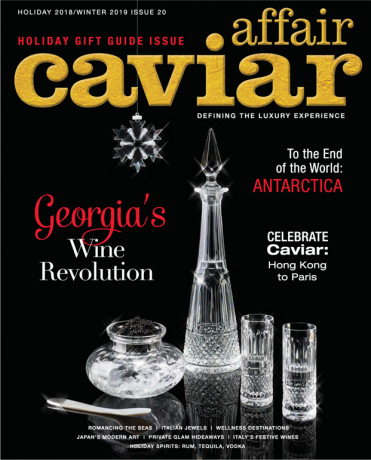 With a buoyant crowd of 2,500 — a full 300 more than last year's record-breaking turnout — the aisles teemed with booths manned by 58 dealers from 11 countries, who will be selling their wares through this Monday. 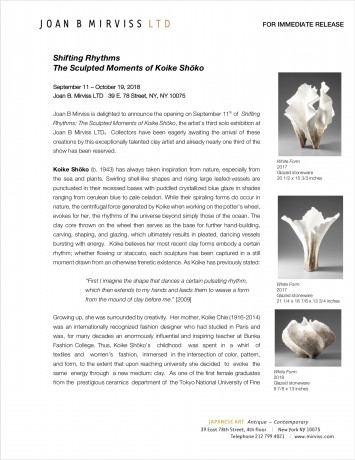 New York dealer Joan Mirviss brought 23 pieces of Japanese ceramics by Koike Shoko, one of the leading female ceramicists to come out of postwar Japan, known for her shell-inspired spiral clay forms. Within a half hour of the show's opening, 22 of them had been sold. 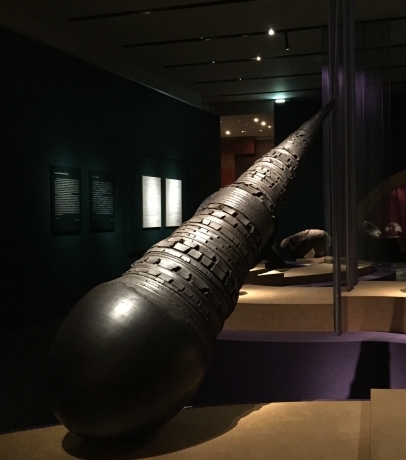 After the tremendous upsurge in interest in contemporary art in 2006-2008, and the market doldrums of 2009, this year’s Asia Week has repositioned itself and was jointly organized by the Asia Society and the Asian Art Dealers of New York (AADNY). 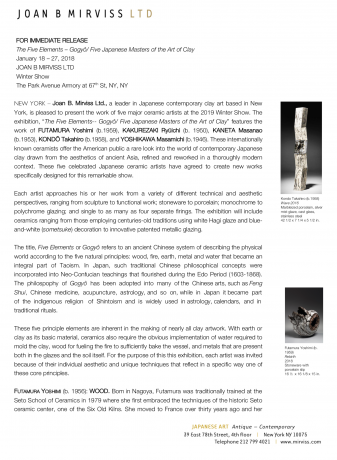 official start of Asian Art Week. 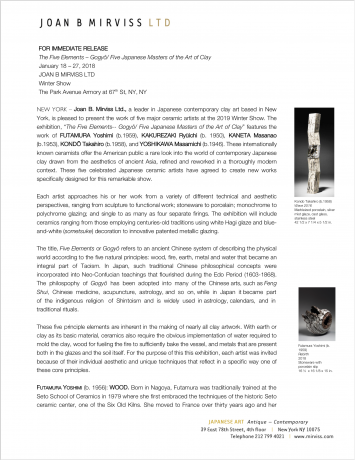 March 13, 2009: As a highlight of Asia Week in New York, we spoke with Joan B. Mirviss, a veteran dealer who specializes in Japanese painting, woodblock prints, and contemporary ceramics. Mirviss discusses the market, the Haughtons, and Kawase Shinobu, the ceramics artist whose work is currently on view at her gallery. 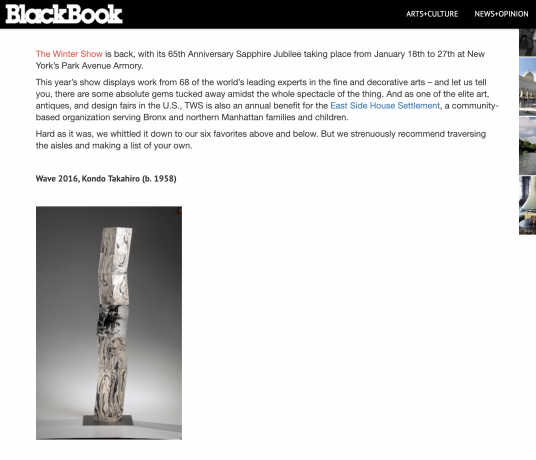 Over the last several years there has been an increasing number of dealers who have chosen to abandon the International Asian Art Fair and to exhibit independently in several locations in New York, principally on the Upper East Side. 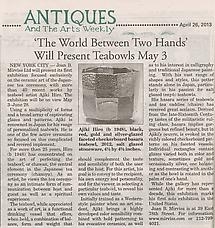 This year, with the International's cancellation, leaving those exhibitors without a venue, and the relocation of the Arts of Pacific Asia Show to new quarters on West 34th Street, a certain level of reorganisation was needed, a situation compounded by the existing economic uncertainty. 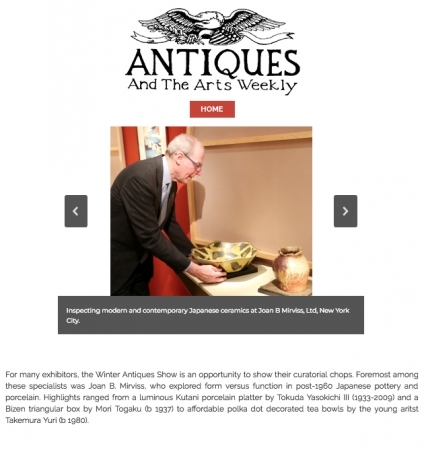 The market for Japanese art and antiques seems to be thriving in Manhattan. Although there are only a handful of serious specialized dealers (private and public), most do well selling a mixture of antique screens, paintings, prints, sculptures, ceramics, lacquerware, metalwork and textiles, Last year Joan B. Mirviss saw her business growing so quickly, after adding contemporary ceramics, that she moved to a new gallery at 39 East 78th Street. This exhibition will mark Joan Mirviss' first anniversary in her Madison Avenue gallery. Kaneta Masanao, born in 1953, is an 8th generation potter at Hagi, one of the greatest of the traditional Japanese kilns. The old Japanese adage is Raku first, Hagi second, Karatsu third. Like the pottery tradition at Satsuma, the Hagi tradition began with potters brought from Korea after Hideyoshi's invasion of that country and, like the early Satsuma wares and others, the Korean potters at Hagi produced wares for the Tea Ceremony. Japanese ukiyo-e prints are certainly hogging the limelight this month, what with the exhibitions at the Brooklyn Museum and the Asia Society and the Exhibition of very early prints and books at Sebastian Izzard Asian Art, this subject-specific exhibition at Joan B. Mirviss Ltd guarantees that the field of ukiyo-e, in all of its shades, will be properly covered and available to be seen. Asia Week in New York is neatly topped and tailed this year. Launching the events is the International Asian Art Fair, which moves both dates and venue to show from 15 to 19 March at the newly refurbished 583 Park Avenue, a handsome red-brick Georgian-style landmark building two blocks south of the fair's previous home in the Armory. 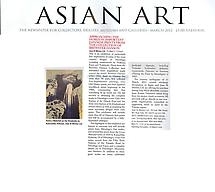 Lingering on beyond the saleroom auctions is a glorious array of dealer shows, which now contribute so much to the diversity and quality of Asian art, old and new, in the city. 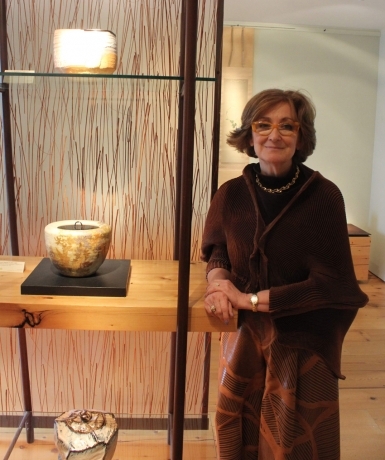 For many years, Joan has been known as a private dealer with respected expertise in Japanese screens, paintings, wood prints and contemporary and modern ceramics. 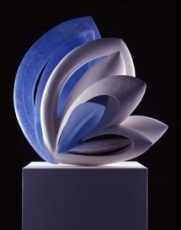 In her new gallery, opened this year to accommodate requirements for established and new collectors, she has organized this exhibition as a subject-specific show of not just contemporary ceramics, but works by today's leading women ceramic artists. No poet, no artist of any art, has his complete meaning alone." So wrote T.S. Eliot in his classic essay, "Tradition and the Individual Talent." Eliot claimed that rather than existing in conflict with tradition, an individual artist gains significance only through strenuous engagement with it. Not surprisingly, Eliot's views remain controversial, but his belief seems strikingly relevant to the extraordinary show of Japanese contemporary ceramics recently on exhibit at New York's Japan Society. Ever since the 19th-century English designer Christopher Dresser picked up a deliberately rough Japanese tea bowl and wrote in ecstasy about the beauty of its texture compared with the sleek industrial finish of Western ceramics, there has been some understanding in the West of Japanese ceramics. This is growing now, fueled in part by the strong market for sculptural ceramics ("craft" is a word best avoided) in the US and Europe. 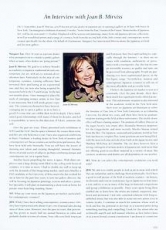 Joan B. Mirviss calls herself a contrarian. 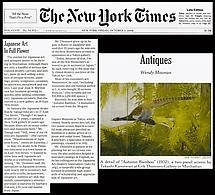 So perhaps it is not surprising that she has just opened a gallery in Manhattan, even as rising rents increasingly cause antiques dealers to close their shops and sell privately. 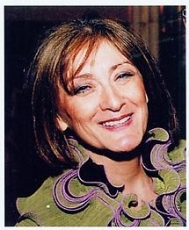 For the last 30 years, Ms. Mirviss has been a pioneering dealer in Japanese fine art and antiques. She has also been the curator of several museum exhibitions on Japanese art, including one in 1995 at the Phoenix Art Museum showing Frank Lloyd Wright's collection of surimono, privately published woodblock prints. Ancient Japanese screens, woodblock prints, scrolls, bronzes and contemporary ceramics by leading contemporary artists are on view in the exhibit "Views from the Past, Visions of the Future: Masterworks of Japanese Art." 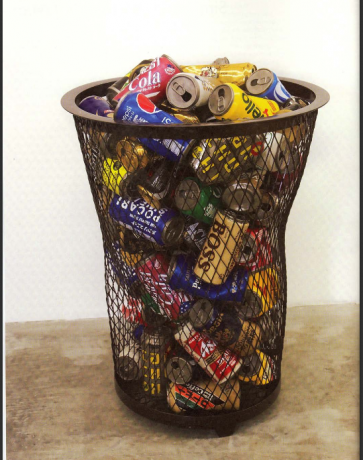 The show marks the inaugural exhibition at the newly opened Joan B. Mirviss Gallery. 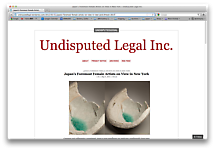 The owner of a gallery selling Japanese art that is opening in two weeks on 78th Street at Madison Avenue is backing into her new project. 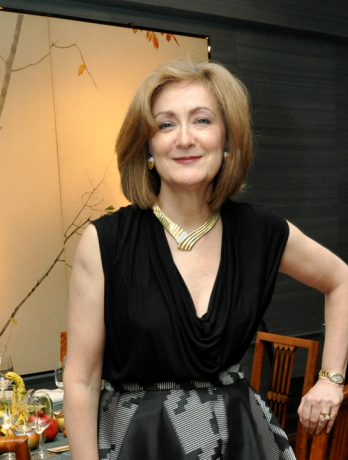 Joan Mirviss, a private dealer of Japanese fine art in America, Japan, and Europe will be turning her art dealing business, Joan B. Mirviss Ltd., into a gallery. "I'm doing everything backwards, as I always have done," the Japanese specialist of 30 years said. "this is a new challenge." Until now, Ms. Mirviss and her staff, three women all with museum experience, worked out of an apartment overlooking Central Park. There has built up a distinguished international clientele largely through exhibitions in other galleries around the country and at major fairs. 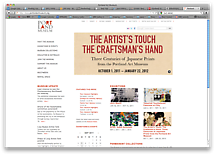 these clients include some 50 of the world's top museums. 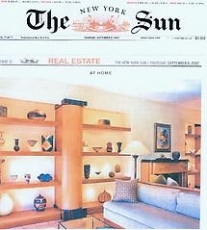 On 17 September, Joan B. Mirviss, a well-known private dealer in Japanese art, is opening a gallery at 39 East 78th Street in New York. The inaugural exhibition of around 55 works, 'Views form the Past, Visions of the Future: Masterworks of Japanese Art,' will be on view until 15 October. Displayed will be screens and paintings, many from old Japanese private collections, as well as woodblock prints and a range of ceramics, both from the second half of the 20thh century and contemporary works created specifically for the show. 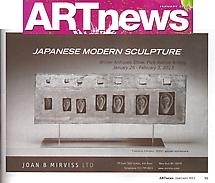 On behalf of Orientations, Margaret Tao interviewed Mirviss about the Japanese art field and her new gallery. 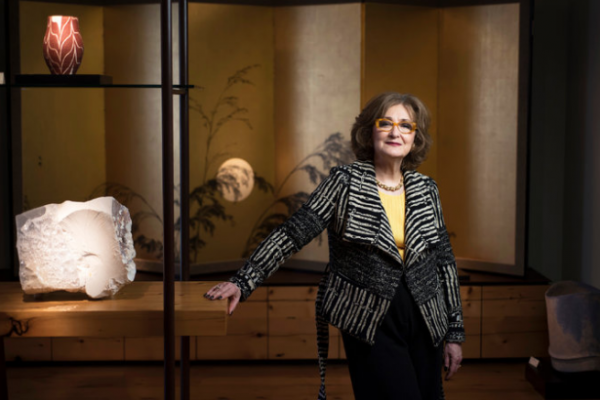 To prepare the space for her first-ever gallery, opening this month on New York's Madison Avenue, Japanese art specialist Joan Mirviss had it blessed by a Buddhist monk. 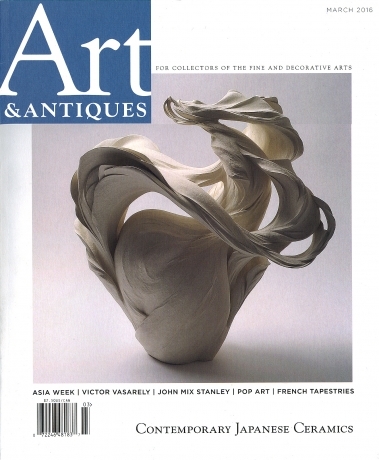 Antiques dealer Joan B. Mirviss has been intrigued by Japanese art since her youth. "As a typical American child of the 1950s and 60s, I didn't have the opportunity to travel to Asia or Europe. However, I always had a fascination with things Japanese." 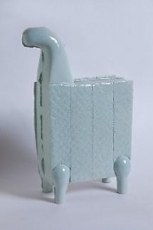 As a university student in 1973 she studied ceramics in Japan and visited famous production centers such as Mashiko. While Japan is crowded with crafts from lacquer to textiles and dolls, it was ceramics that won her heart.